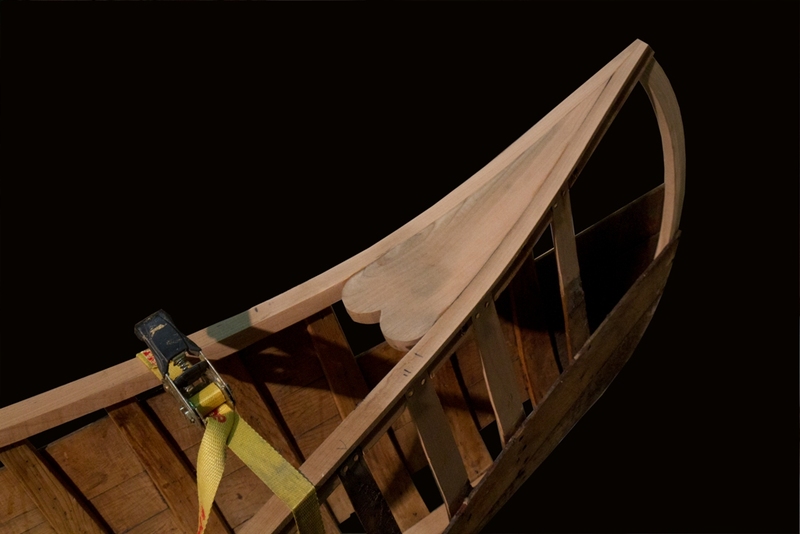 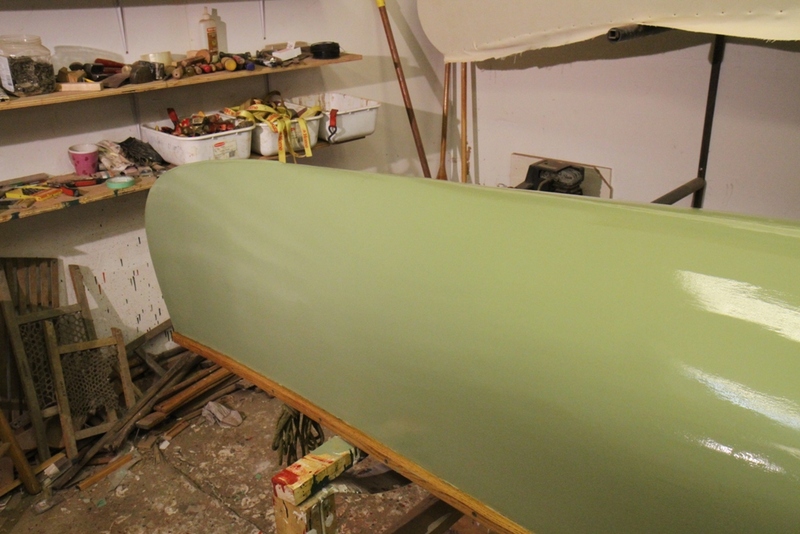 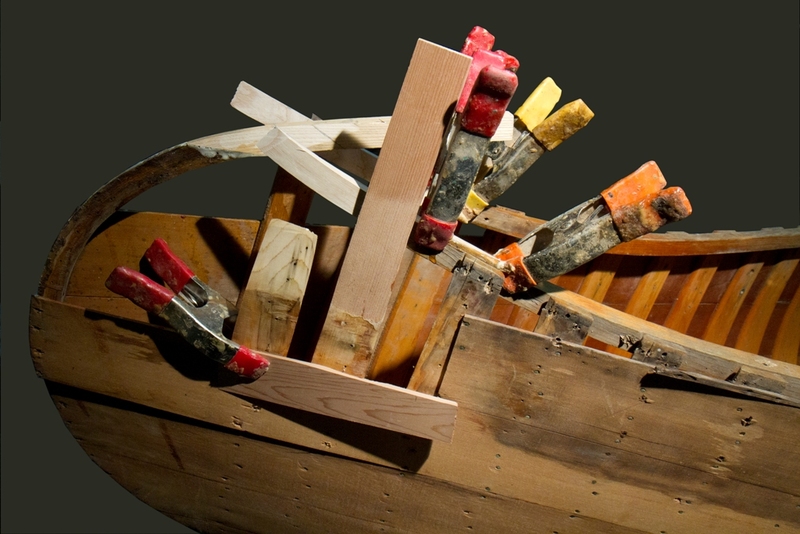 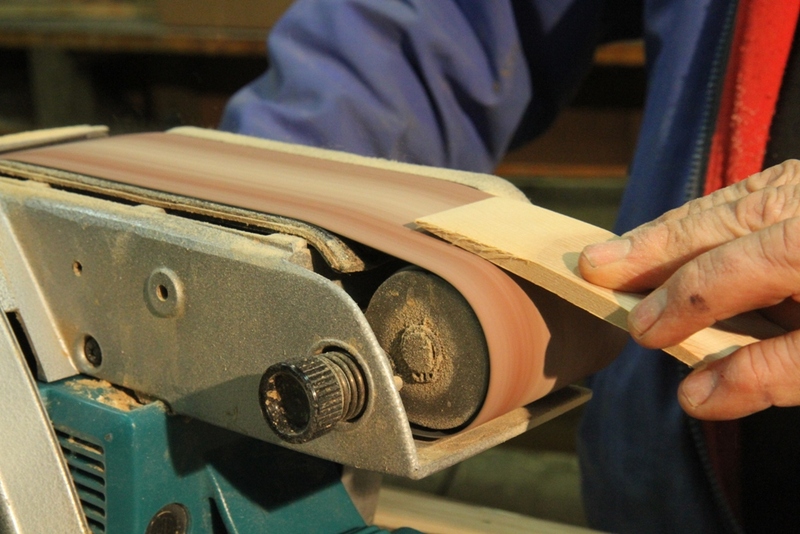 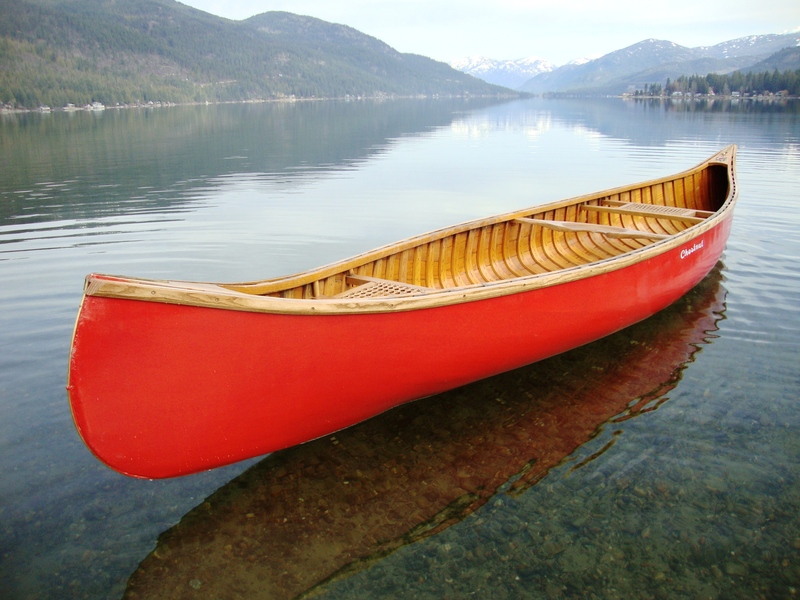 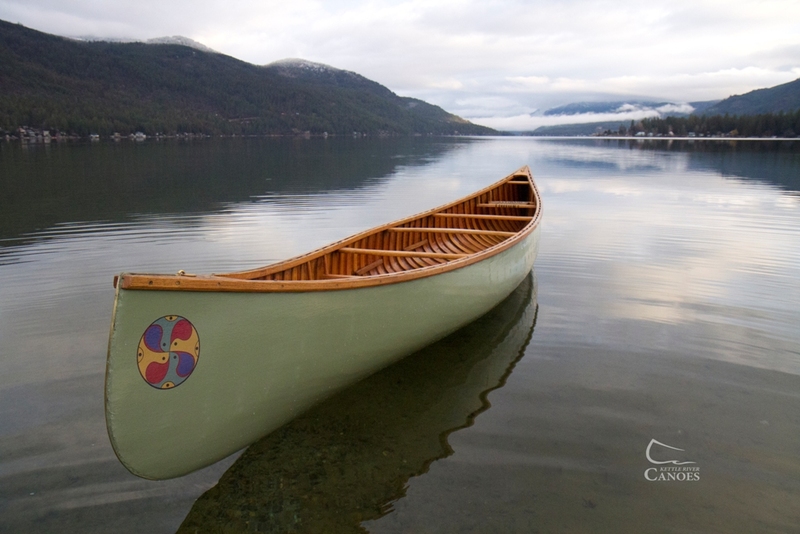 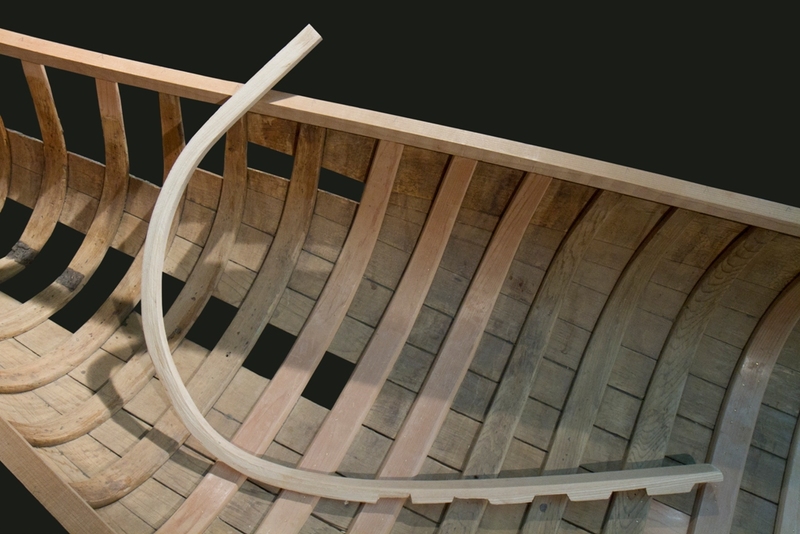 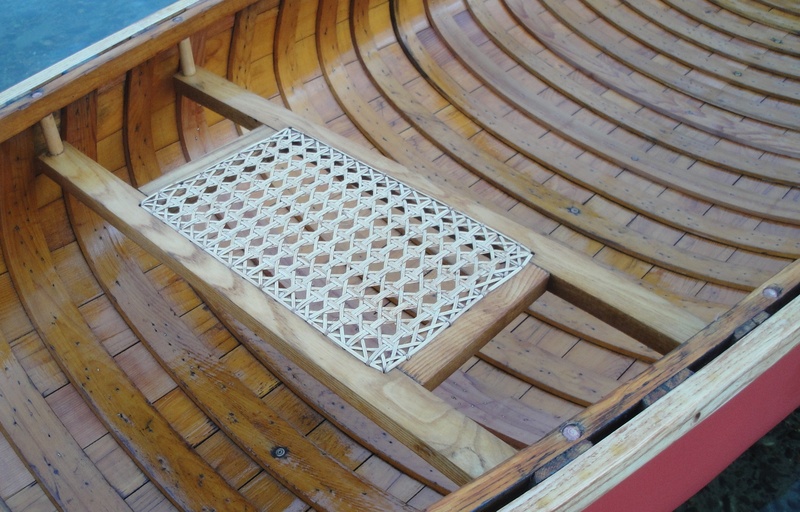 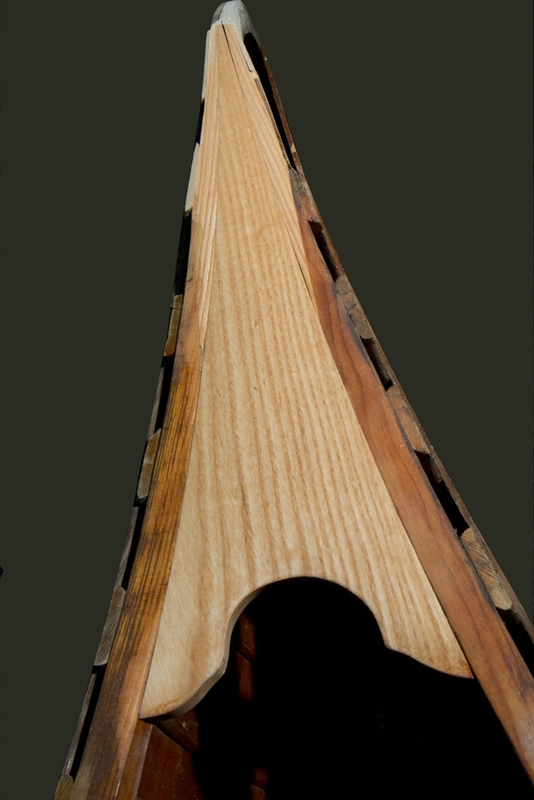 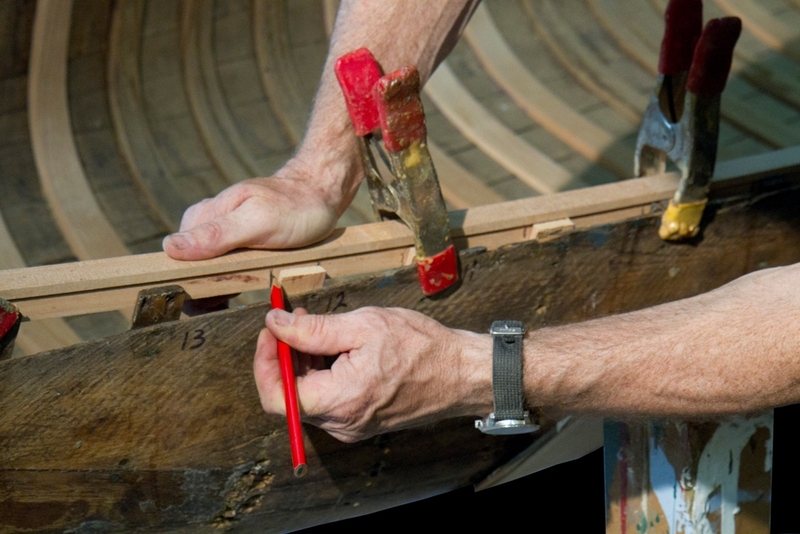 Wood-canvas canoes are works of art. 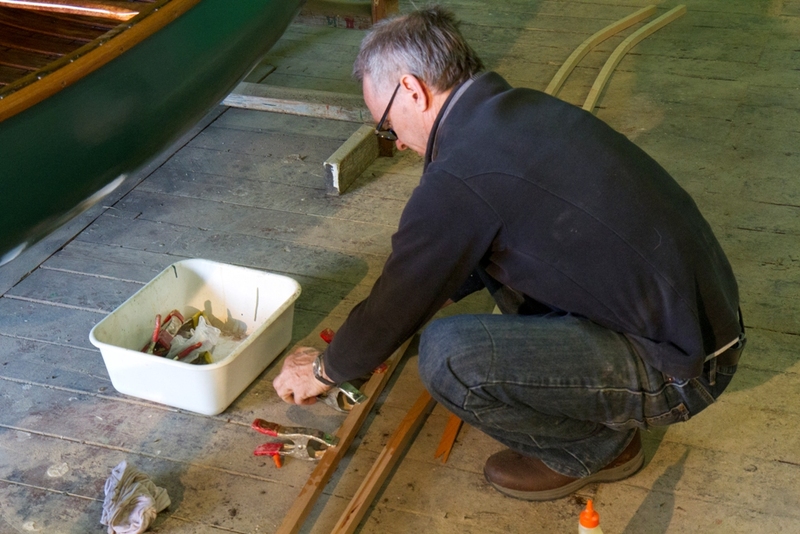 However, in Canada, they are also working boats. 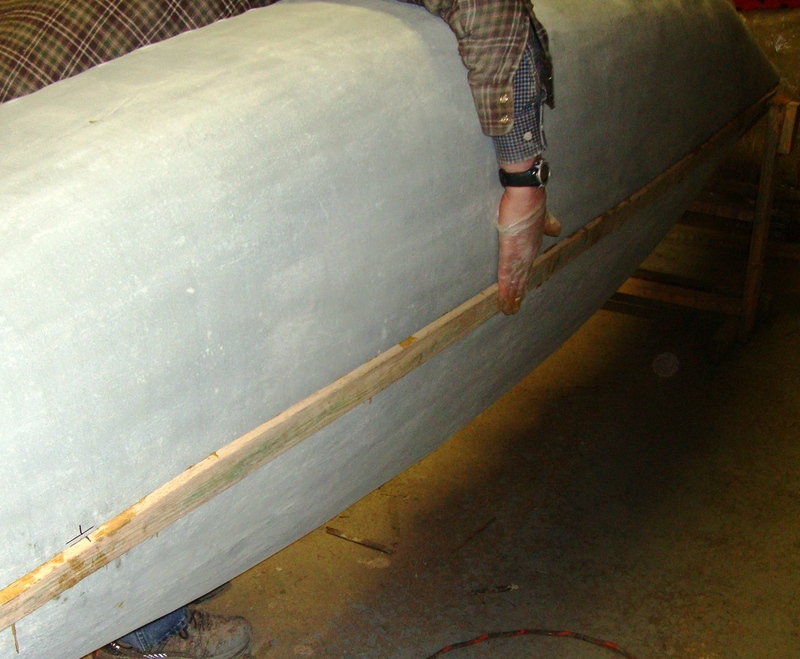 They help their owners navigate large, rapid rivers on a regular basis. 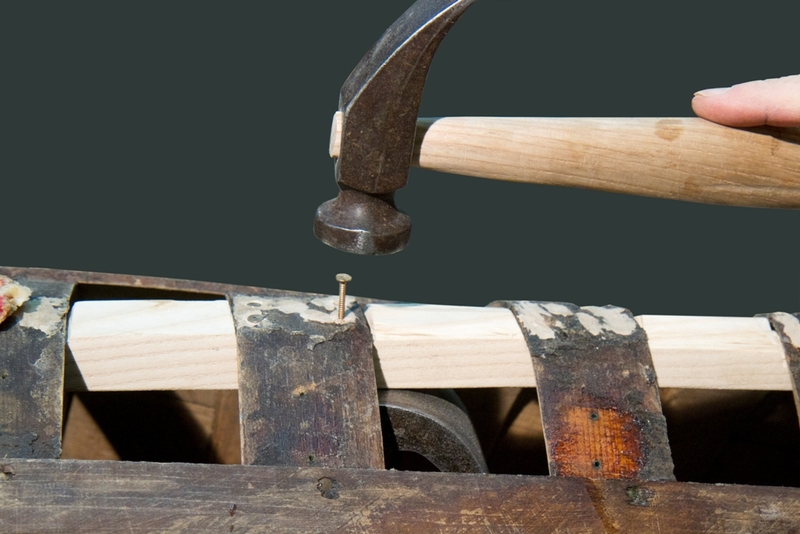 In the course of these journeys, the stem-bands will knock against rocks. 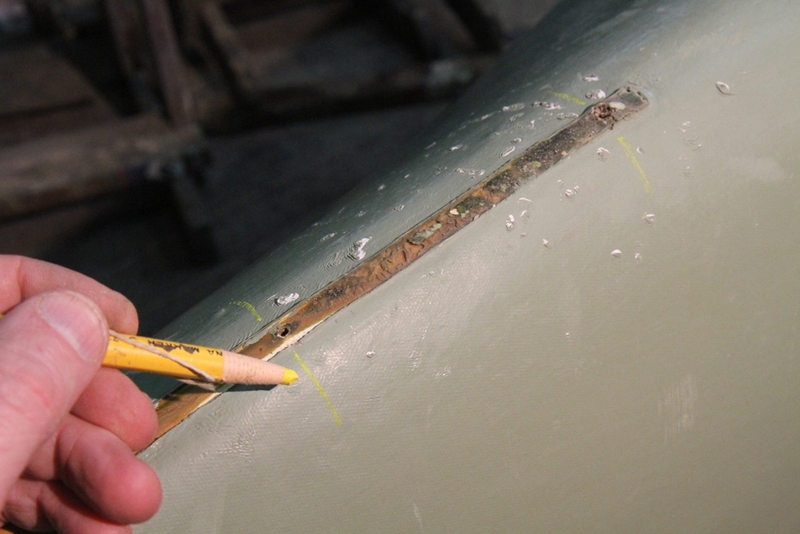 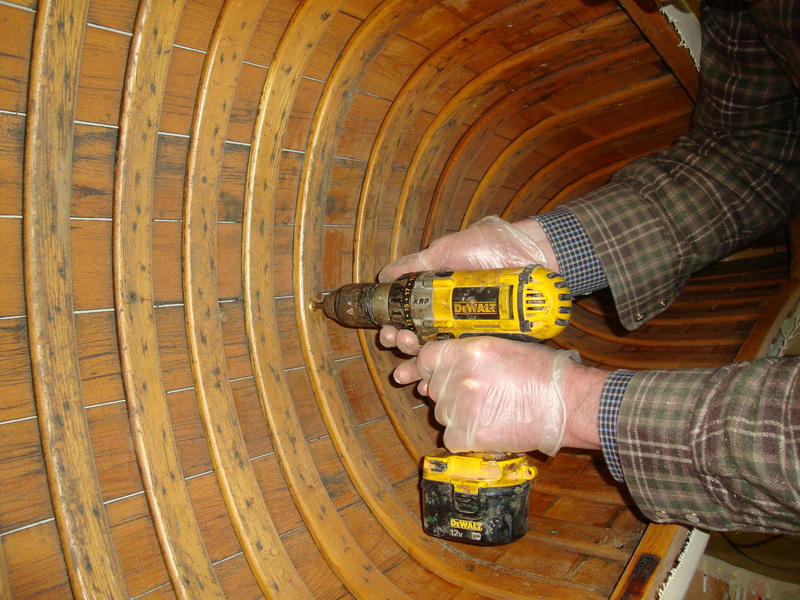 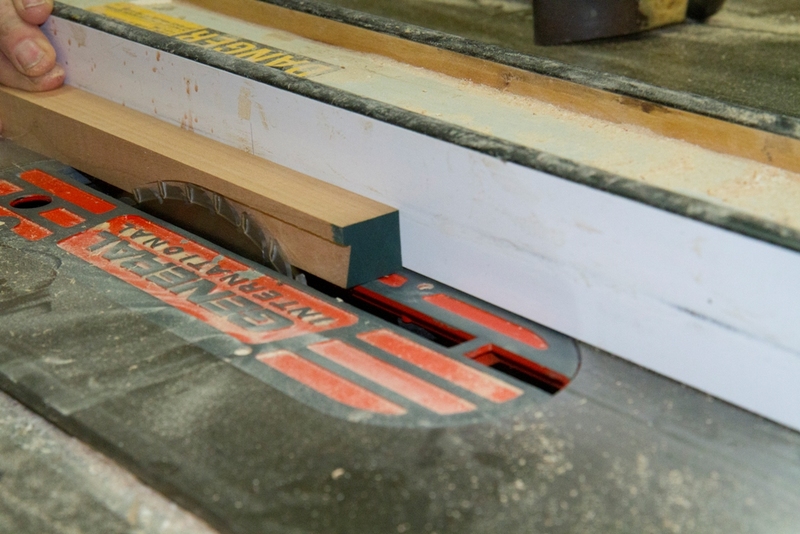 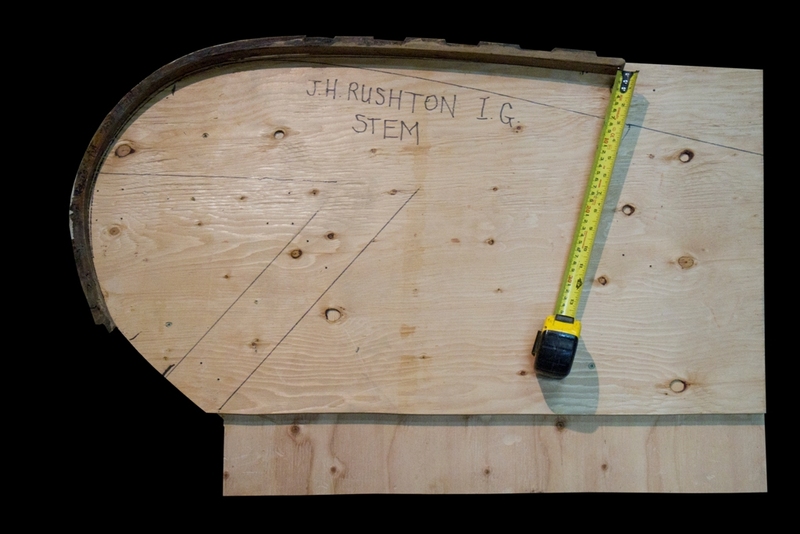 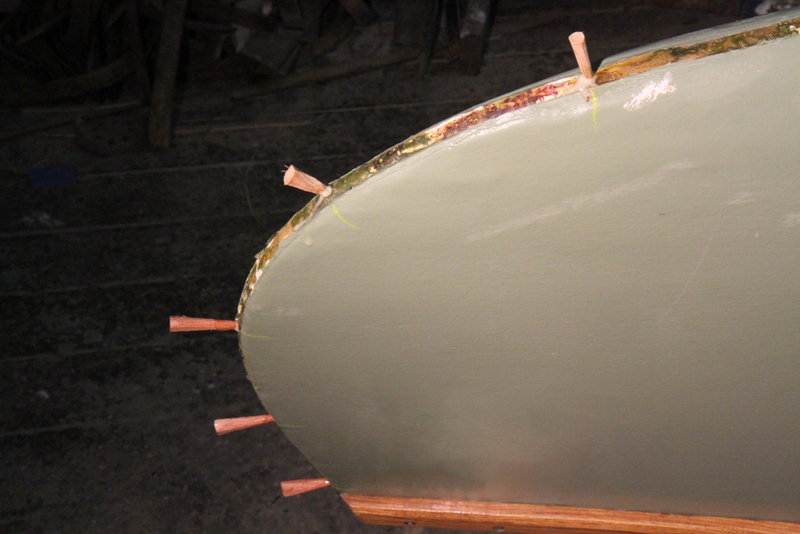 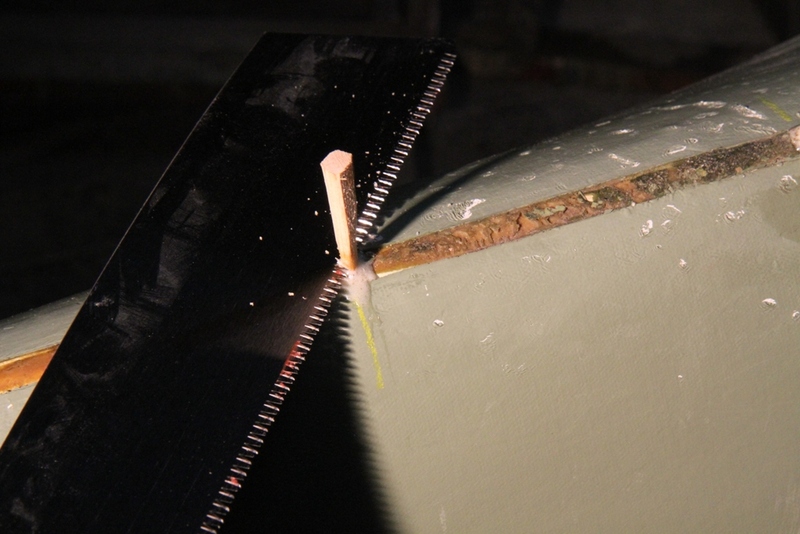 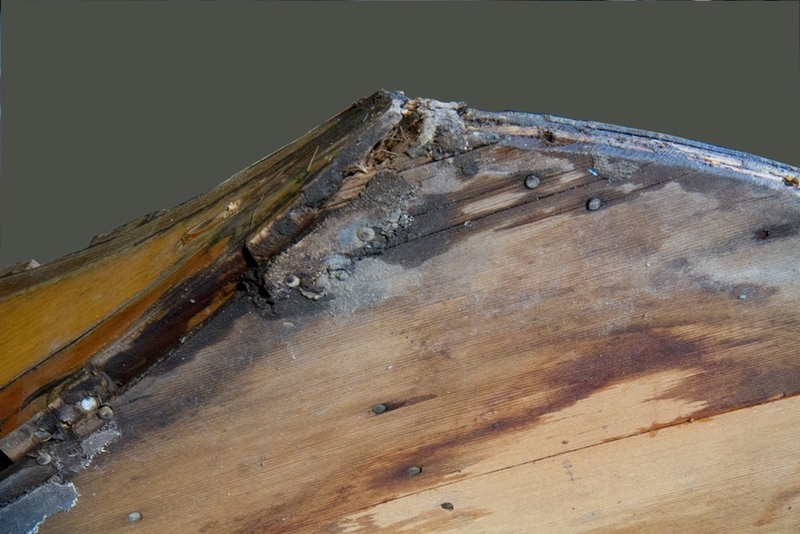 After a while, the canoe will begin to leak as water seeps in through the screw-holes. 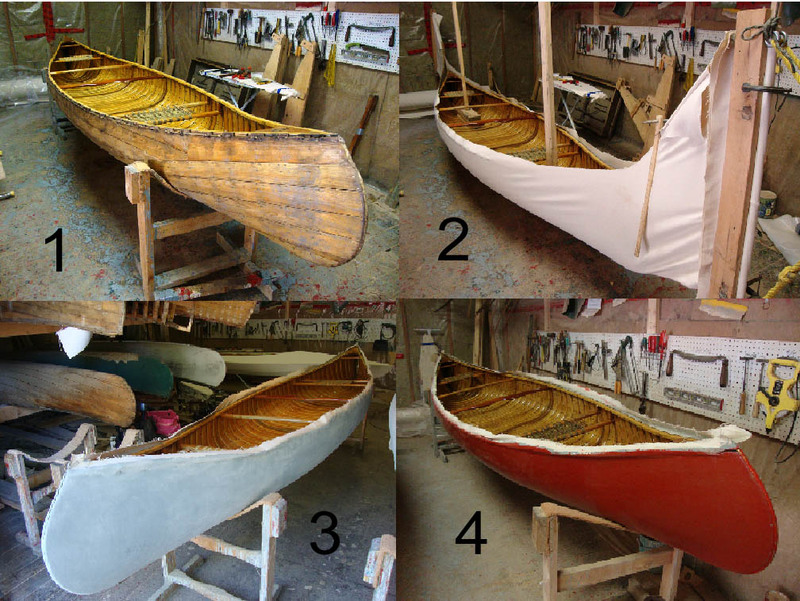 I restored a canoe for a client a few years ago and now he brought it back to the shop for a little repair work. 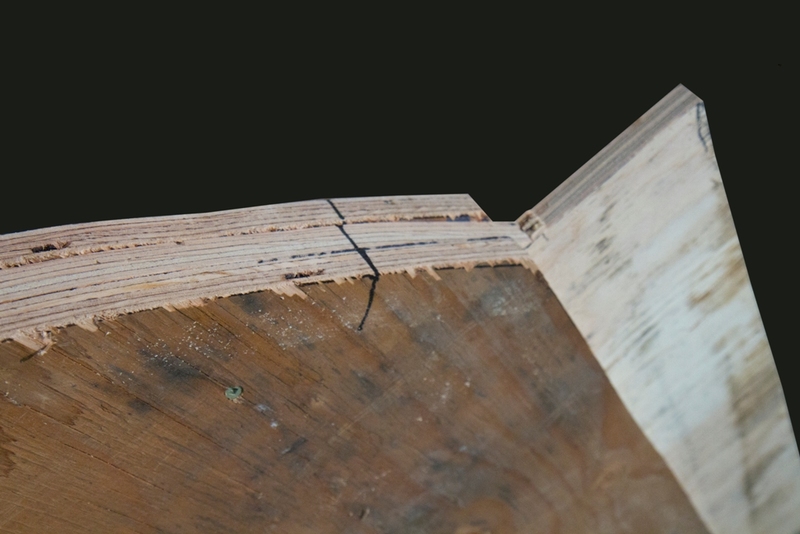 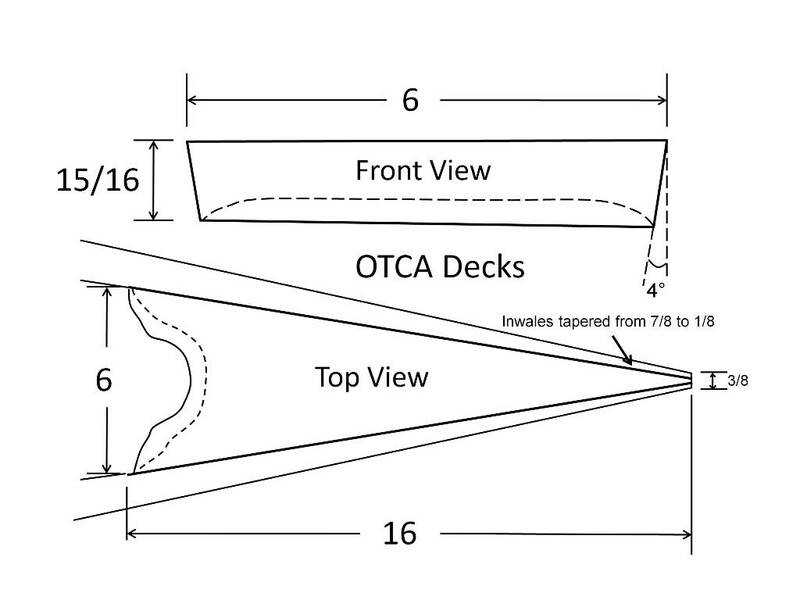 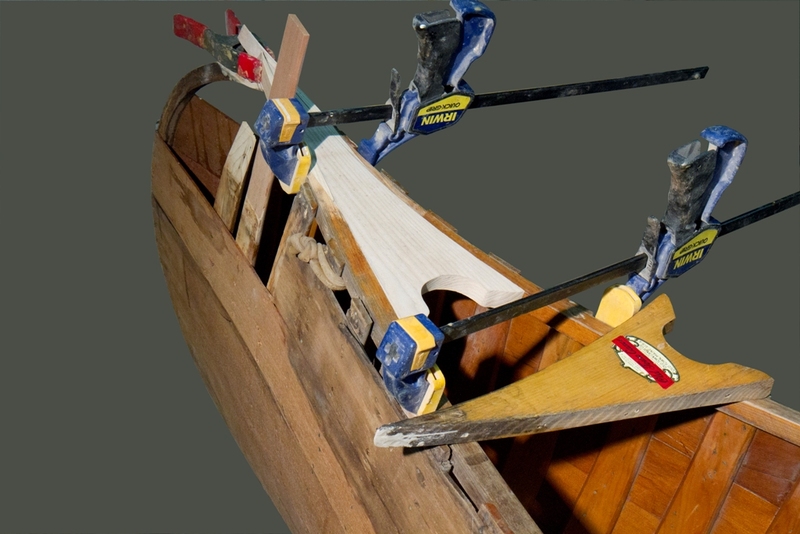 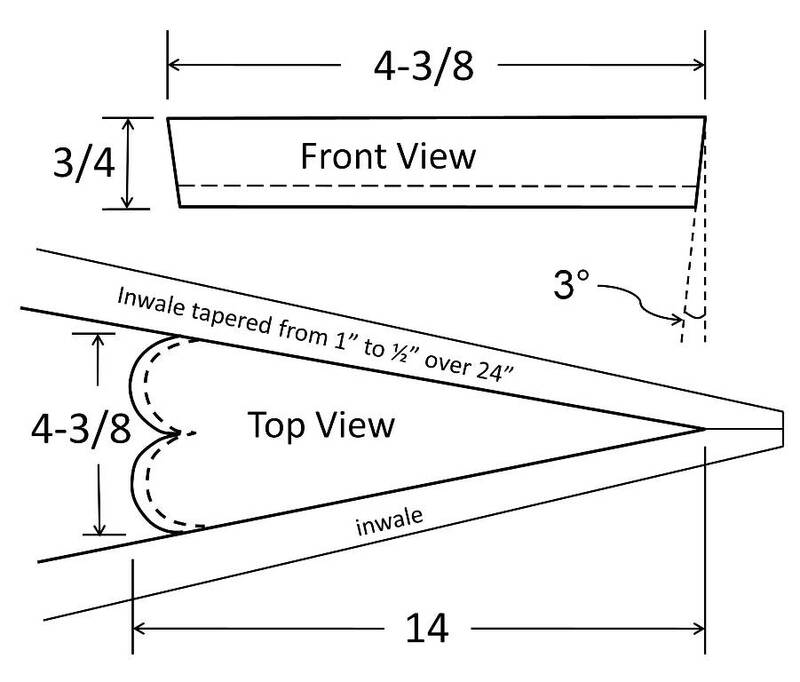 The screws holding the bow stem-band to the hull had worked loose and the seal had broken between the hull and the stem-band. 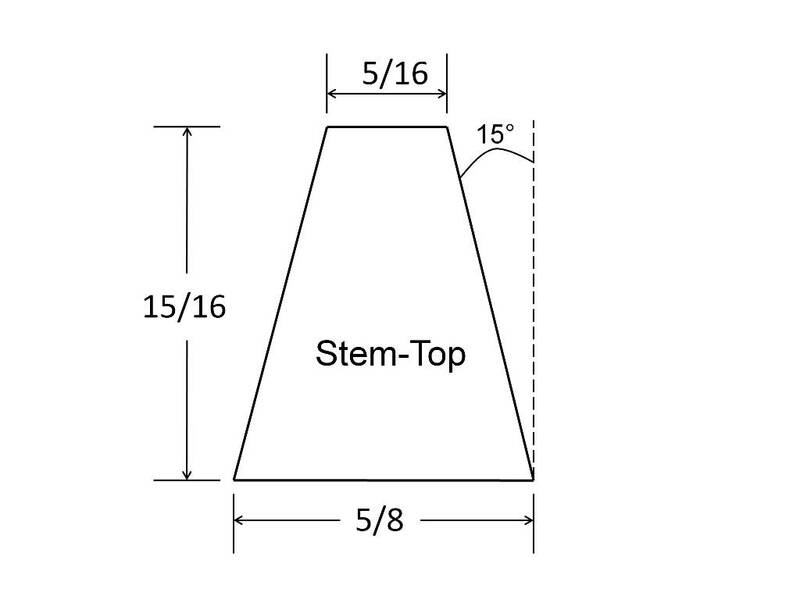 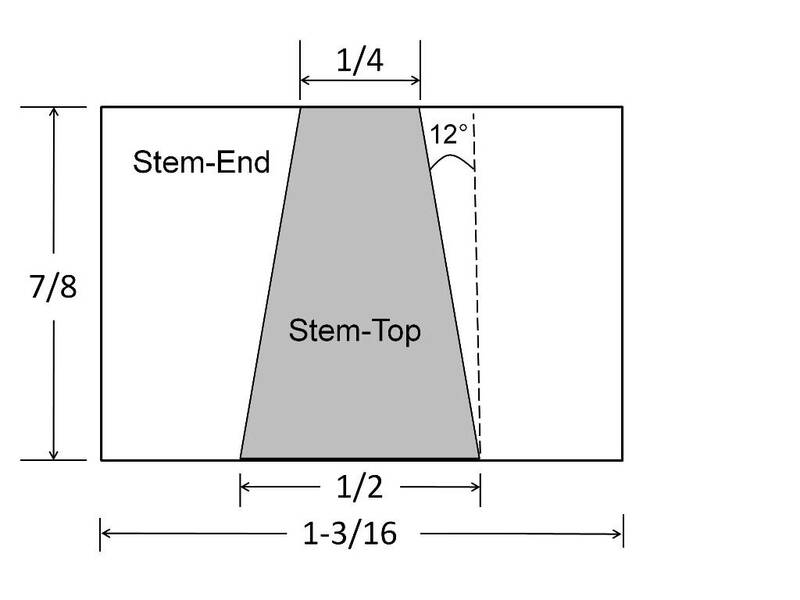 I started by removing the stem-band. 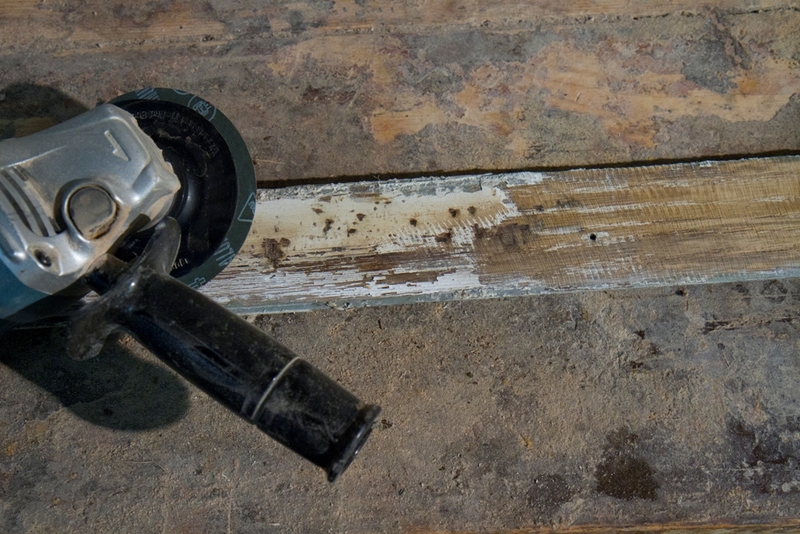 Some of the screws had been worn down to the point where a screwdriver was no longer effective. 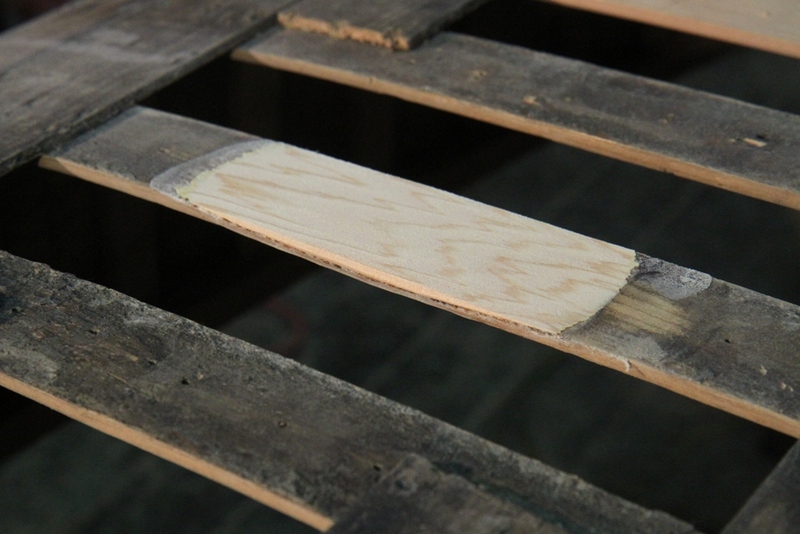 A cats-paw pry-bar and a mallet popped the stem-band off in short order. 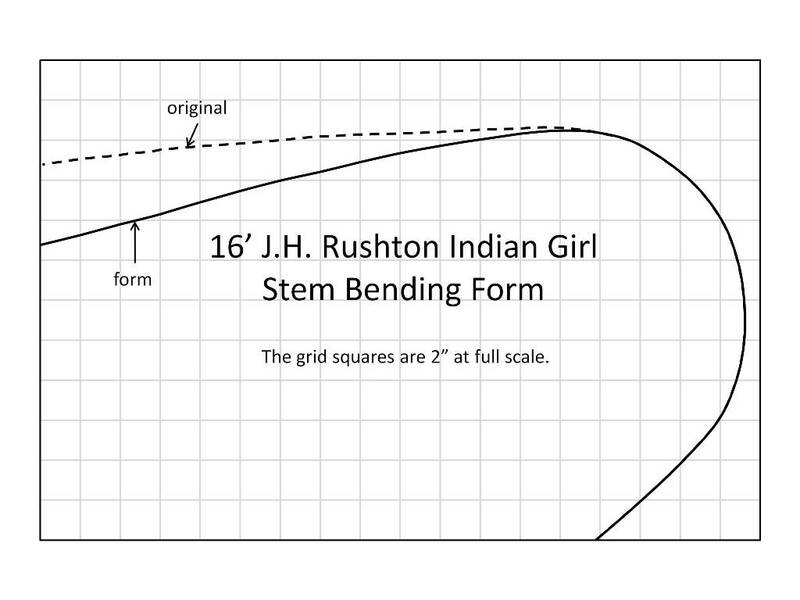 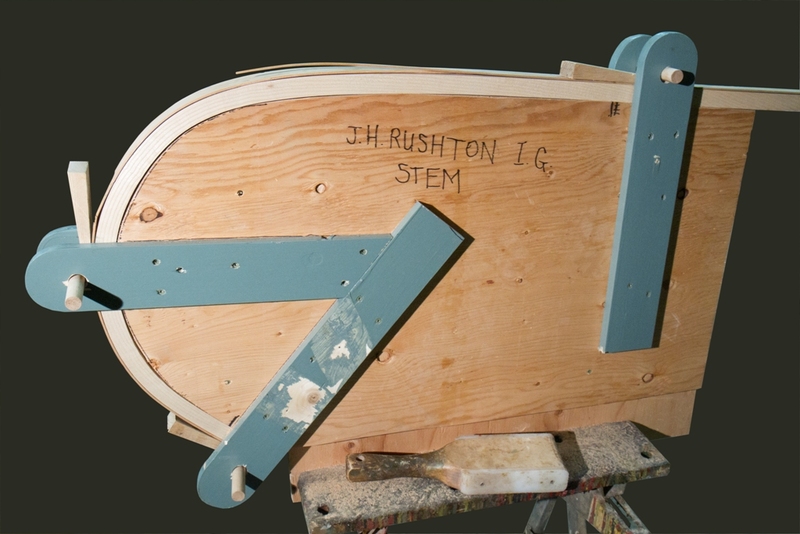 The stem-band was set aside to be re-installed later. 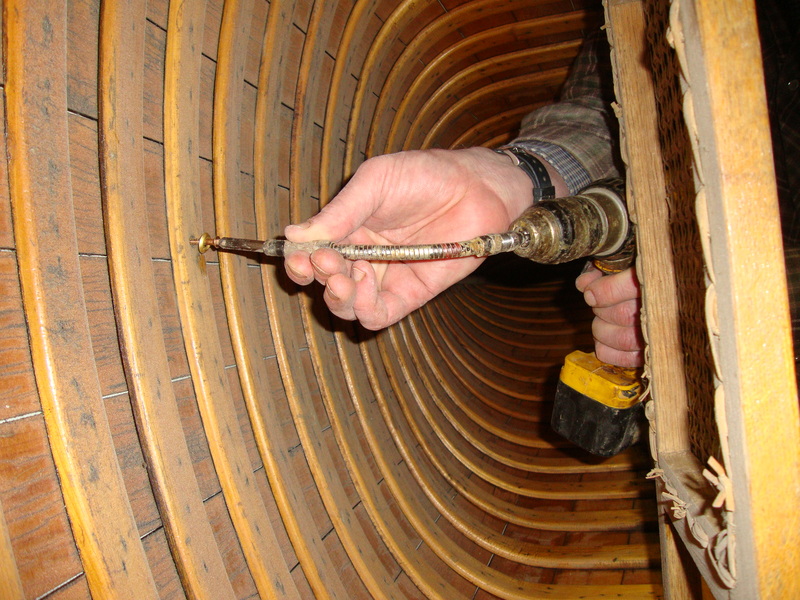 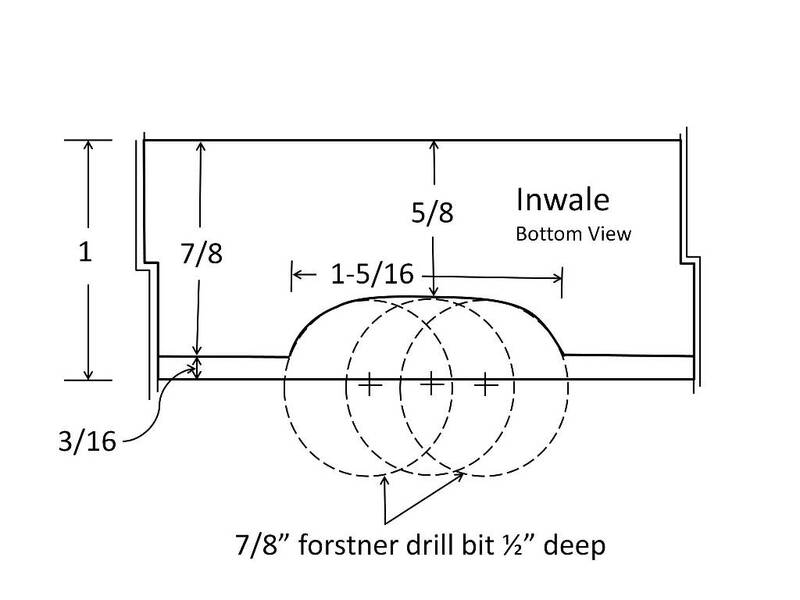 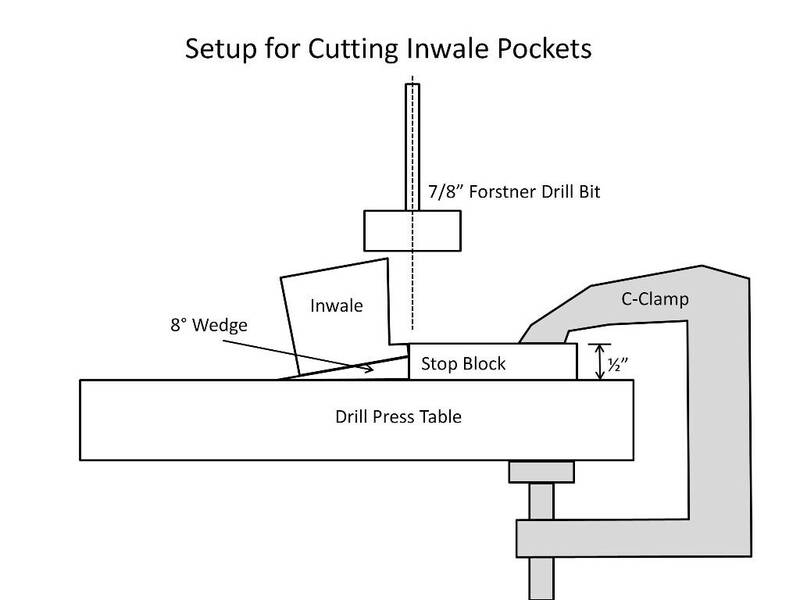 The location of every screw-hole was marked with a grease-pencil. 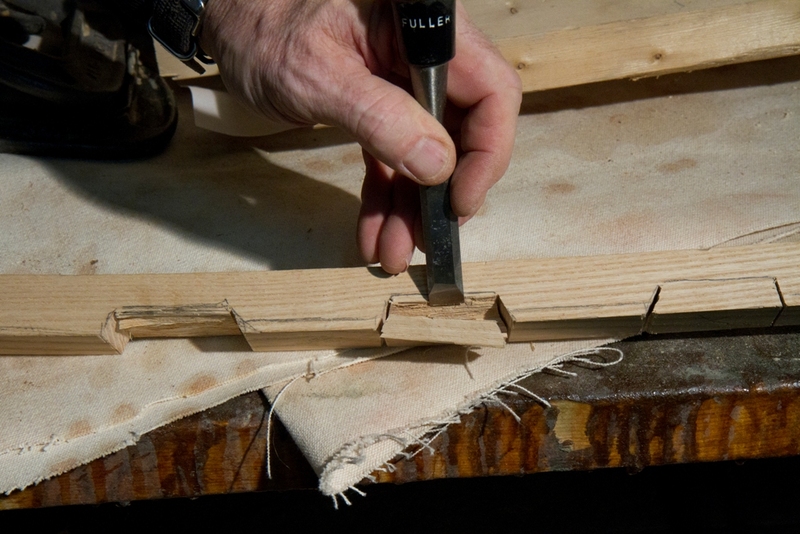 Small pegs were whittled from a scrap piece of cedar. 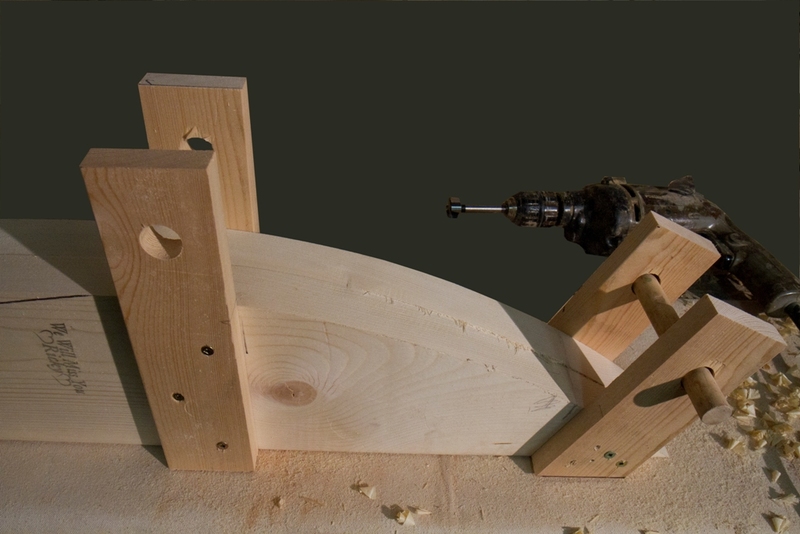 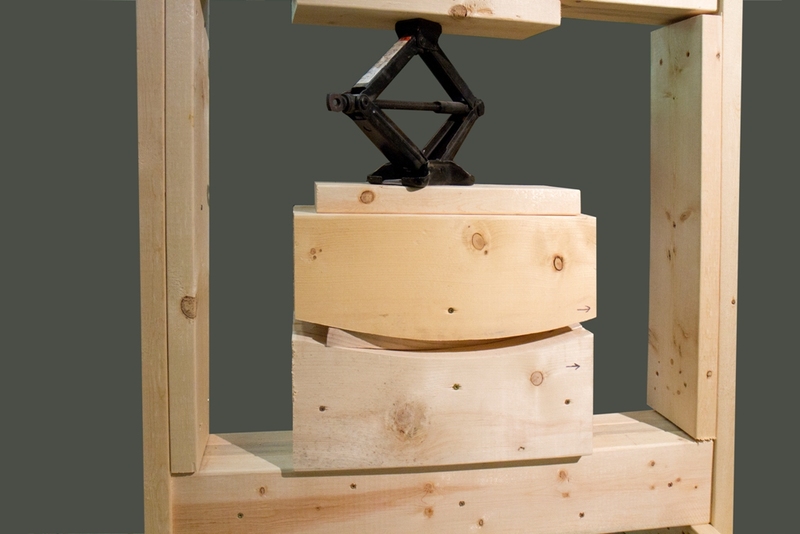 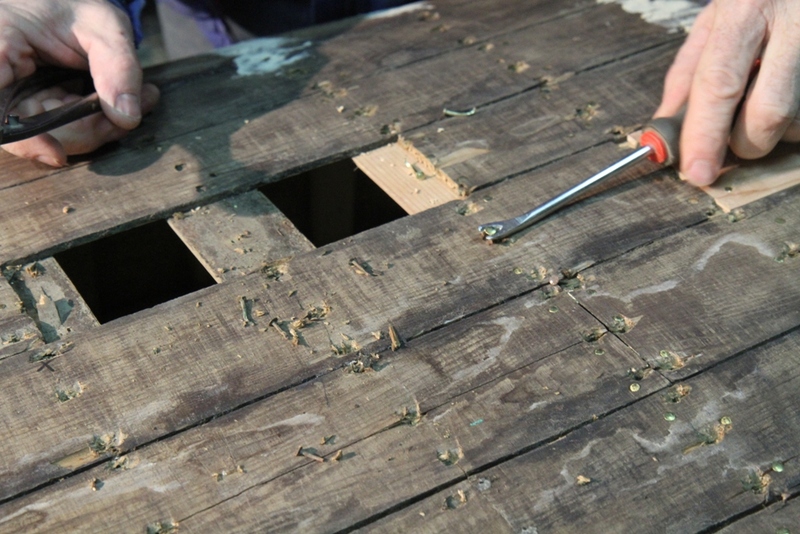 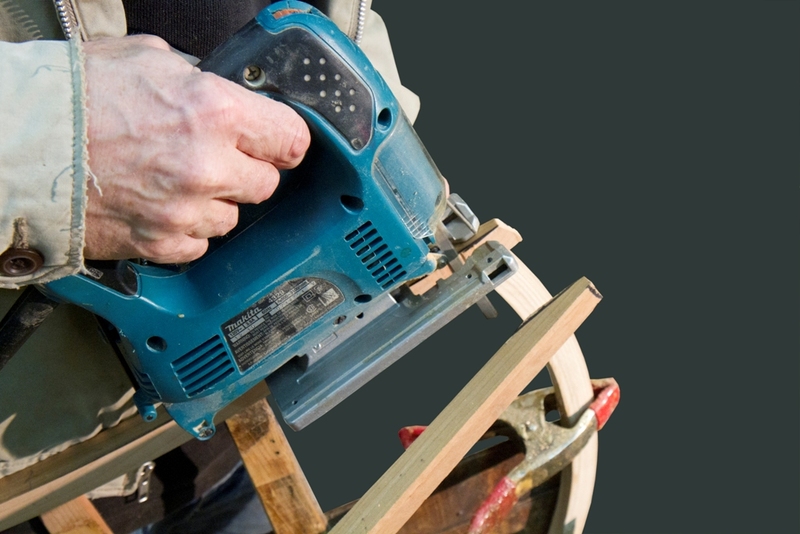 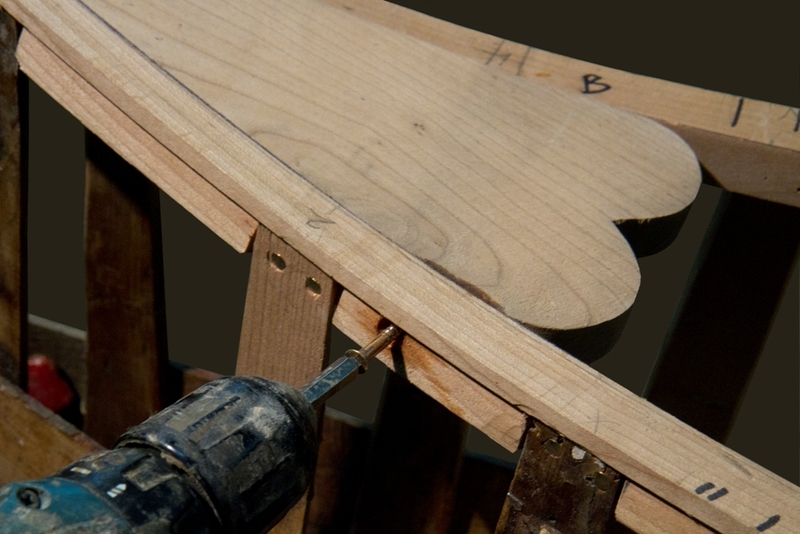 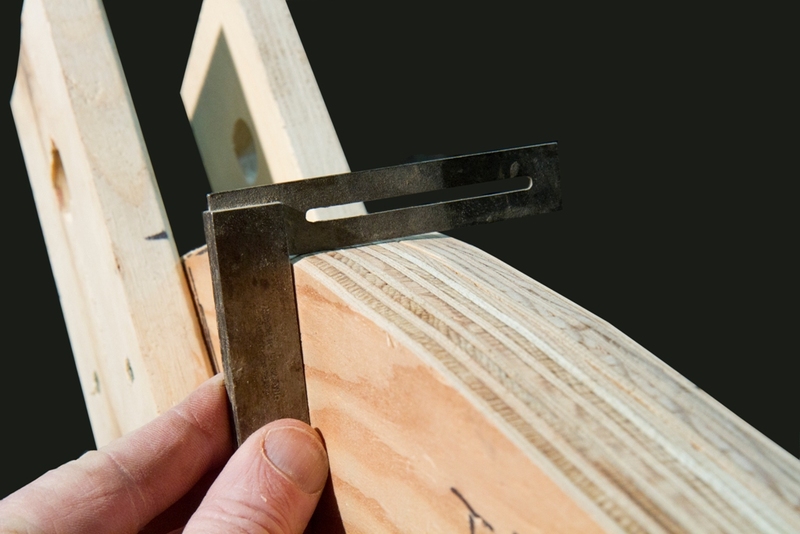 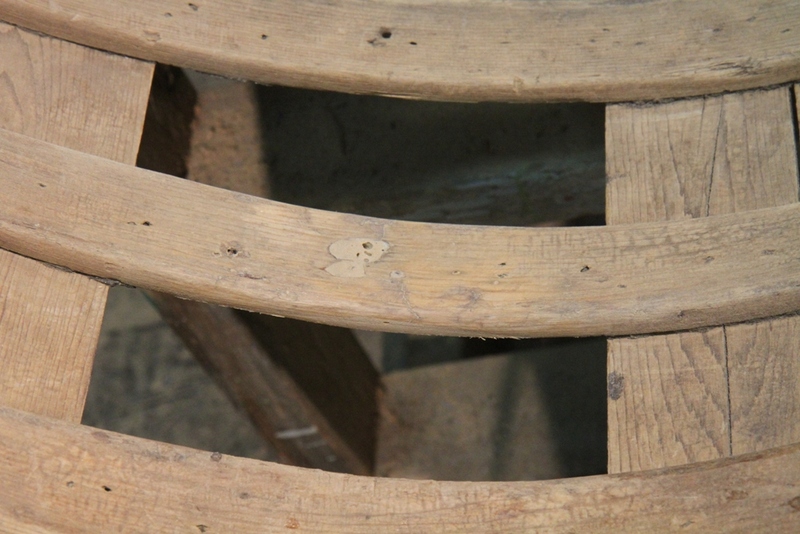 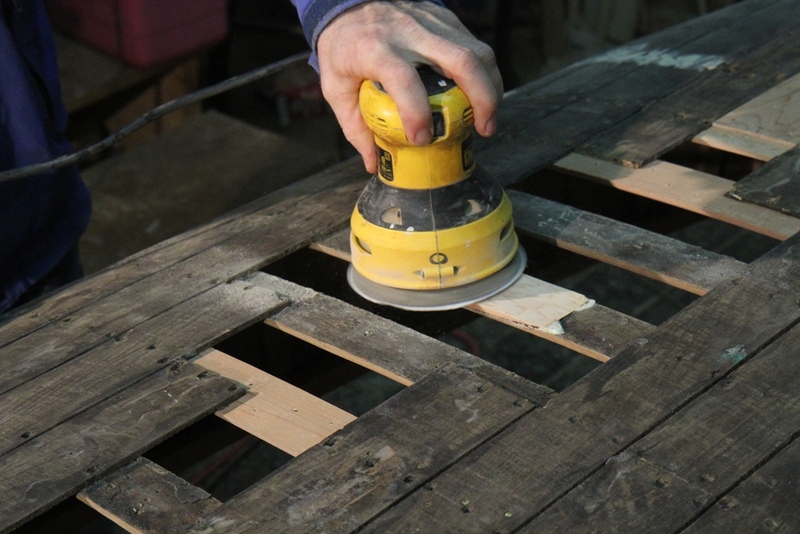 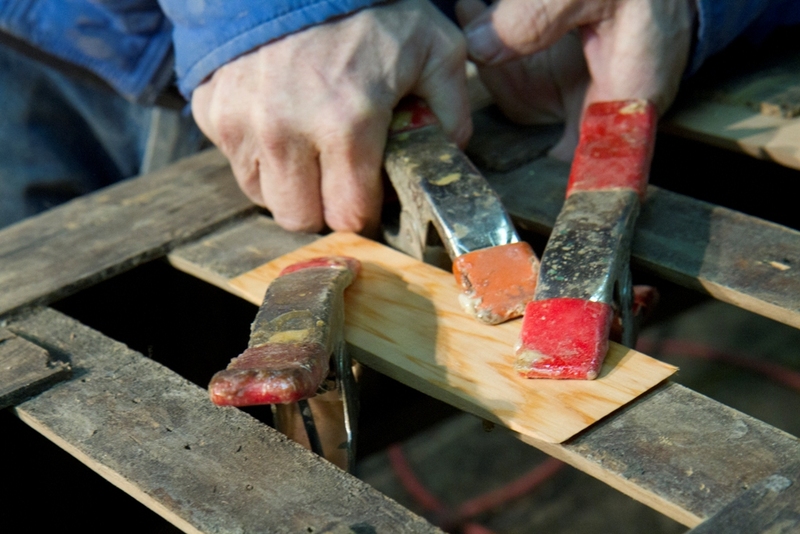 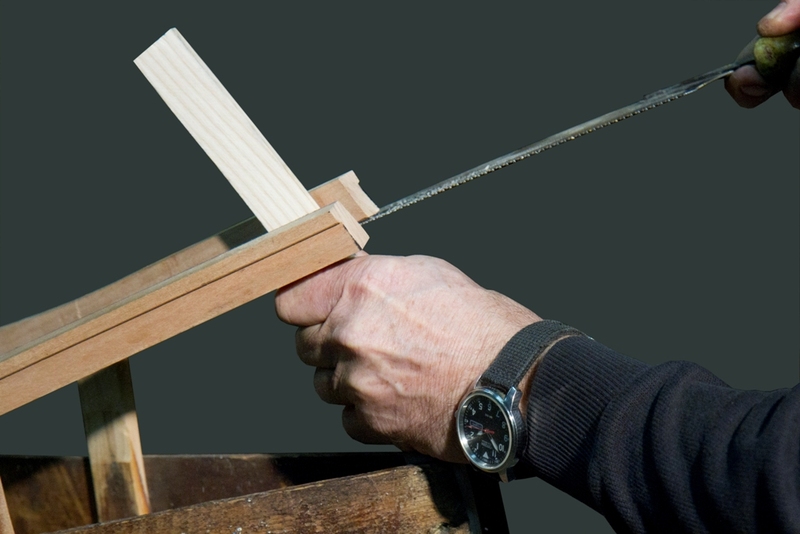 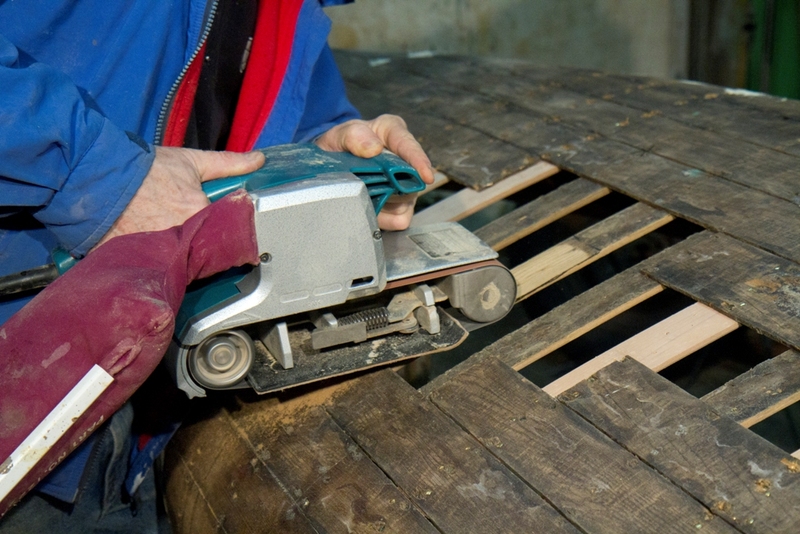 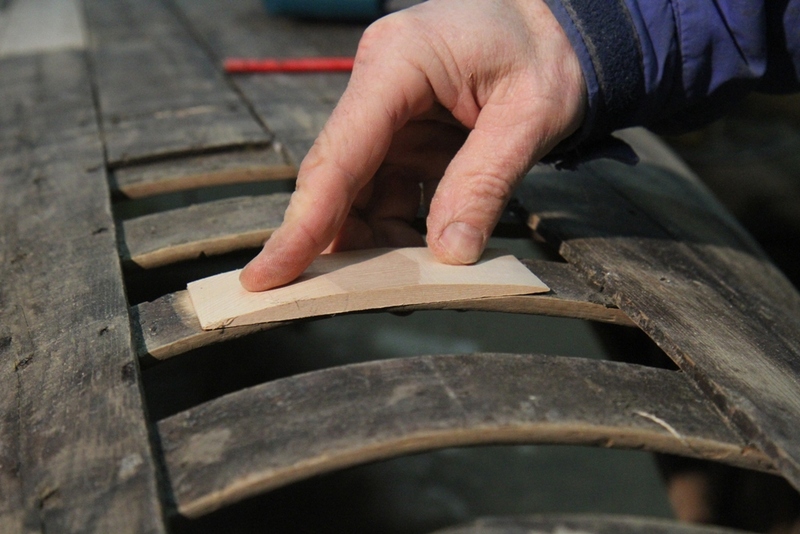 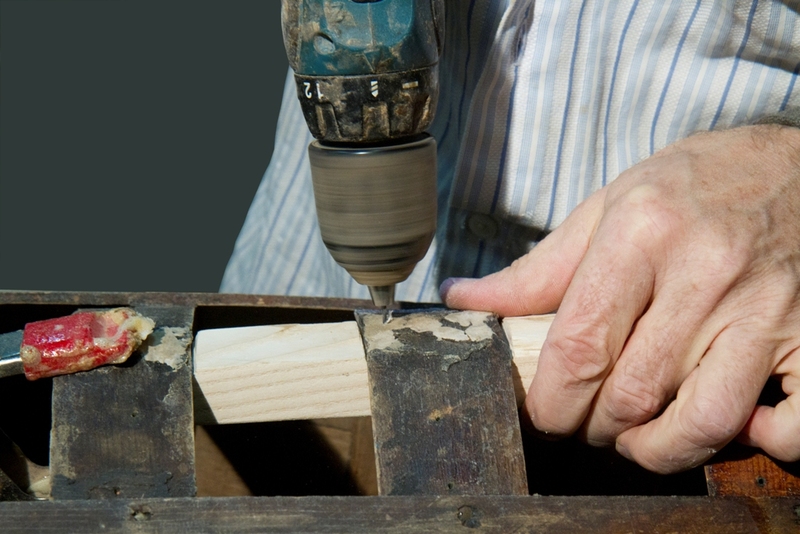 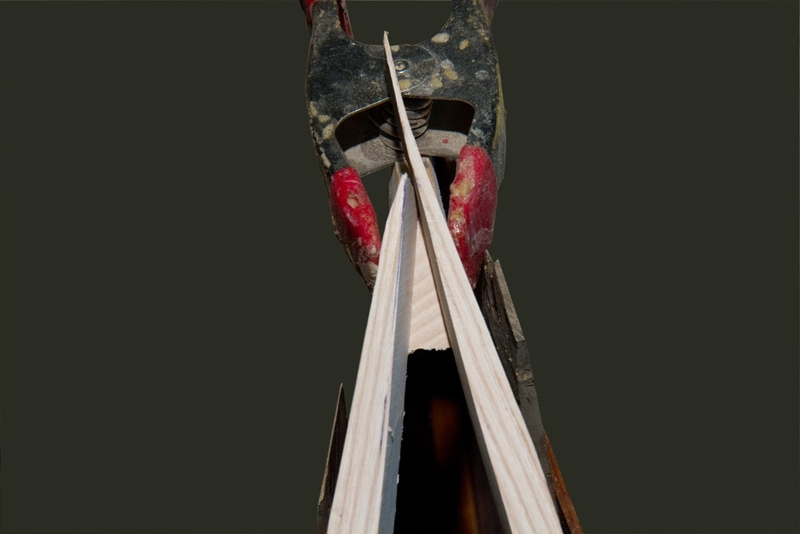 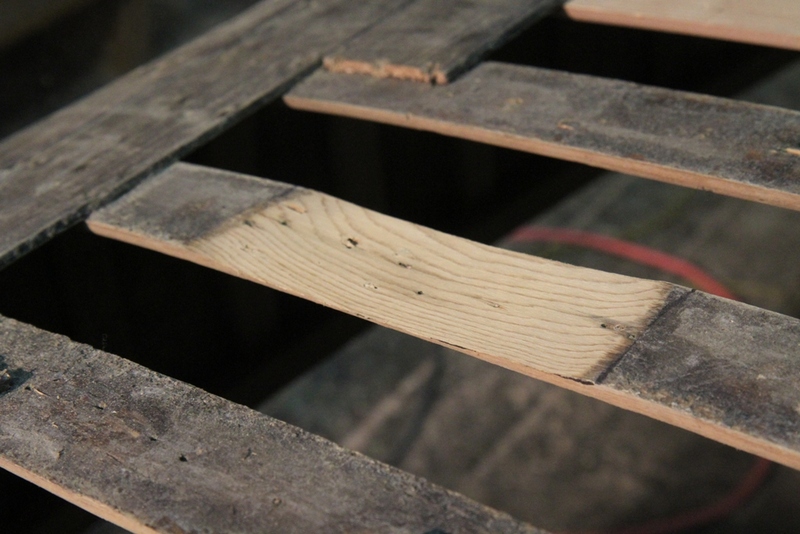 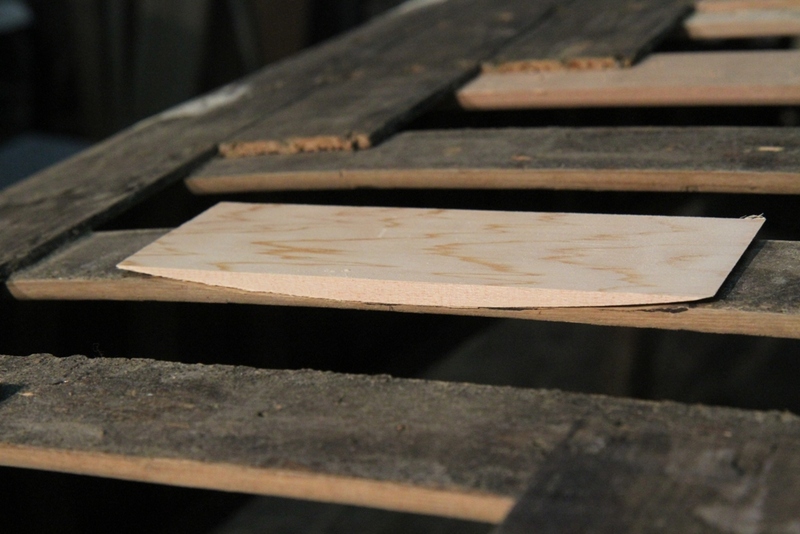 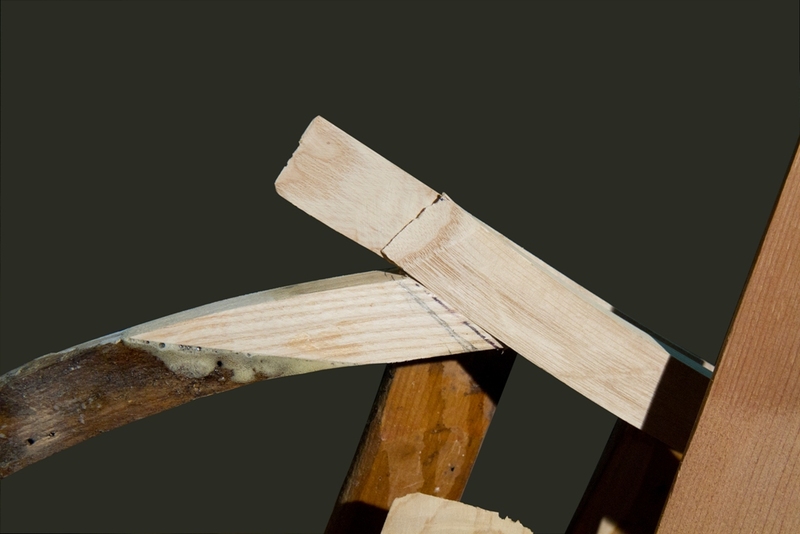 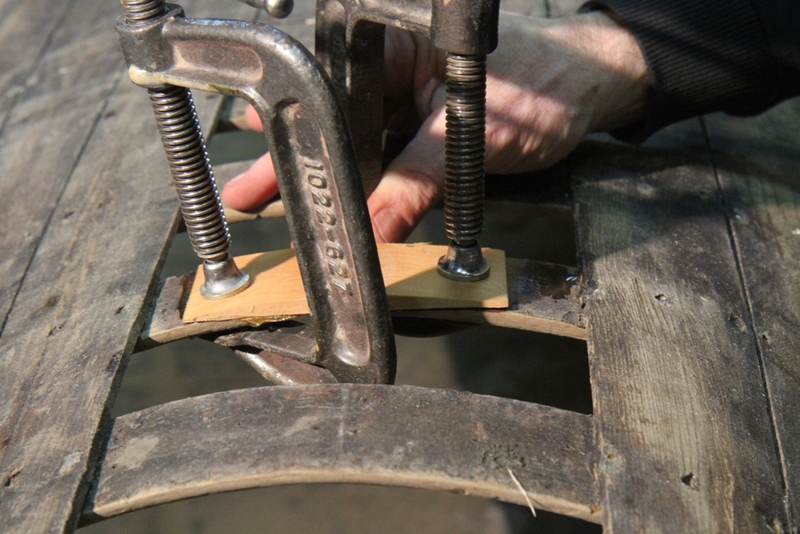 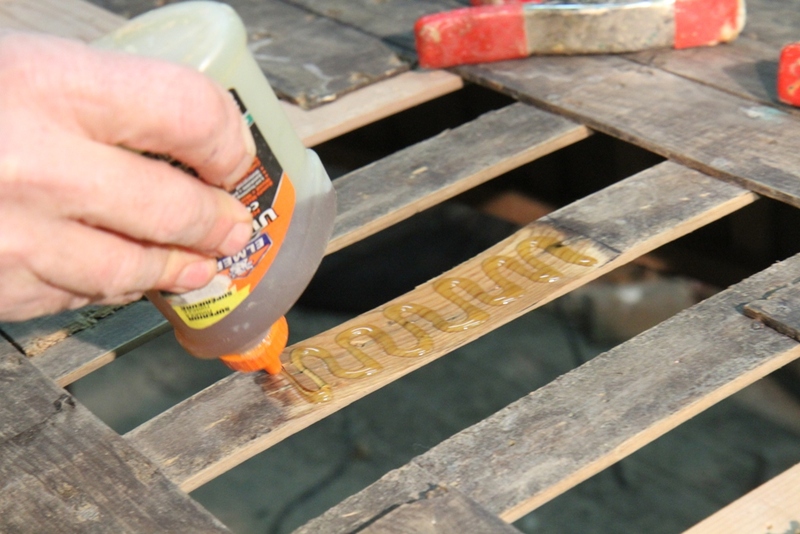 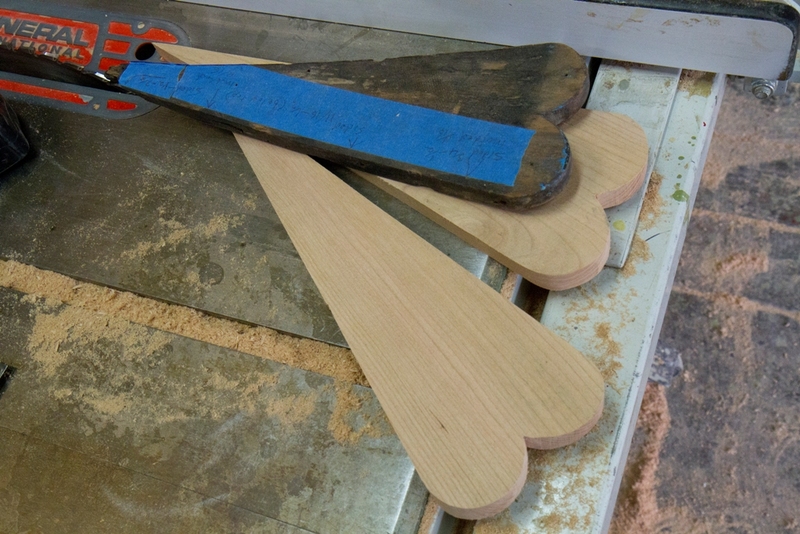 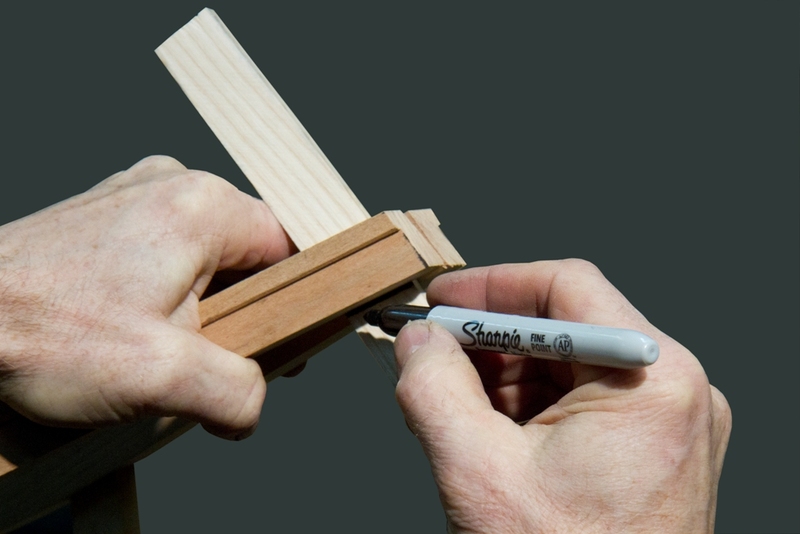 The pegs were dunked in water, coated with polyurethane glue and tapped into the screw-holes with a mallet. 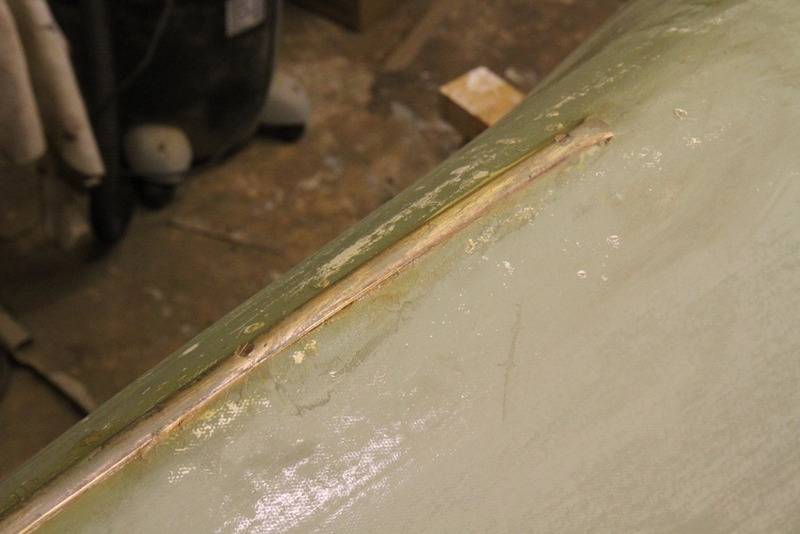 The glue was allowed to cure overnight. 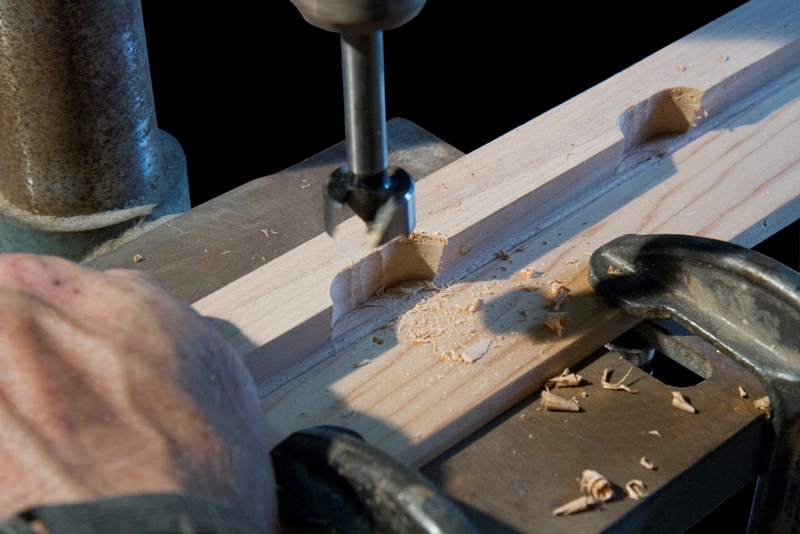 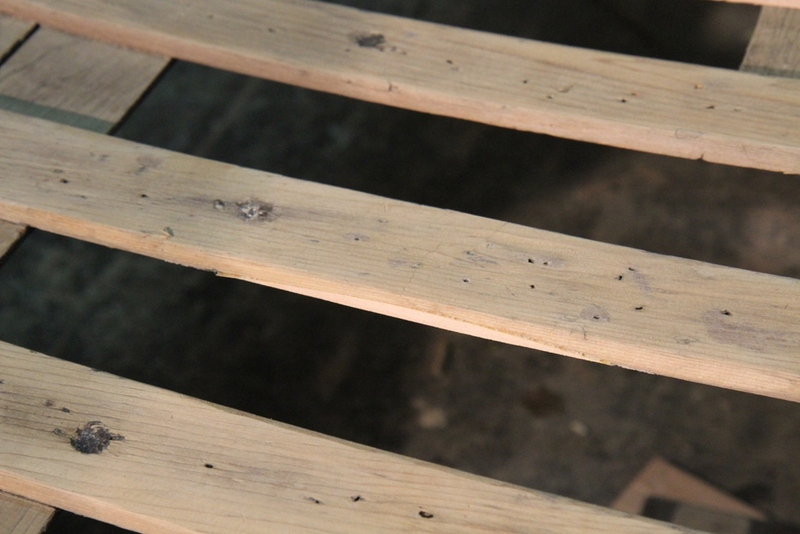 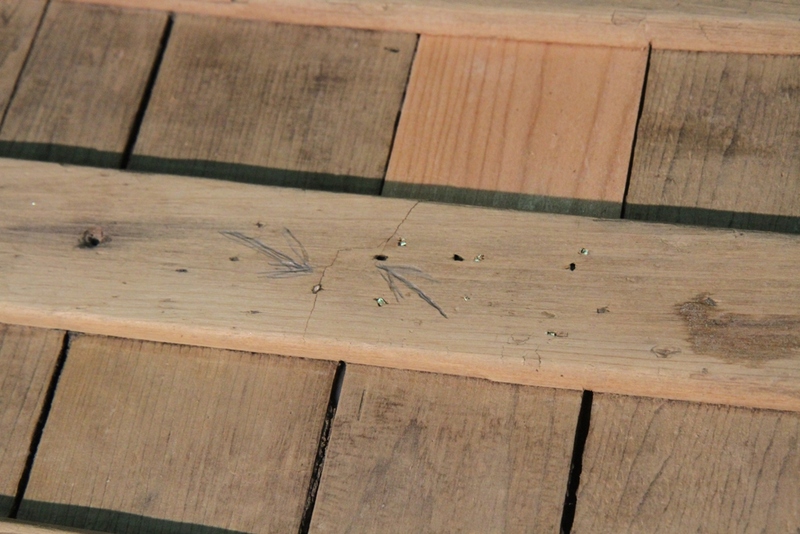 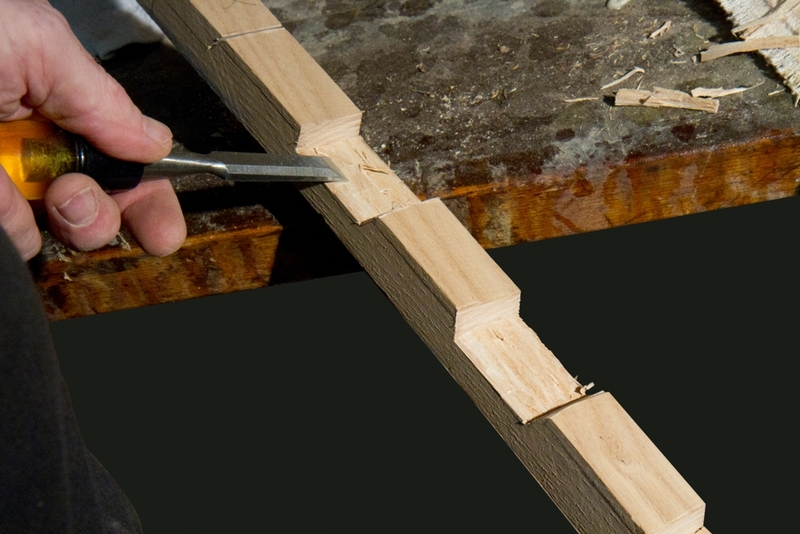 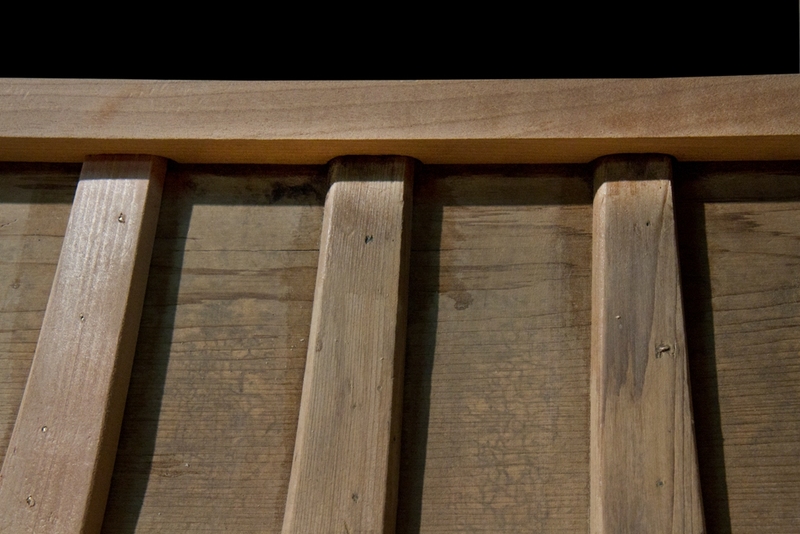 Each of the cedar pegs was cut flush with a Japanese cross-cut saw. 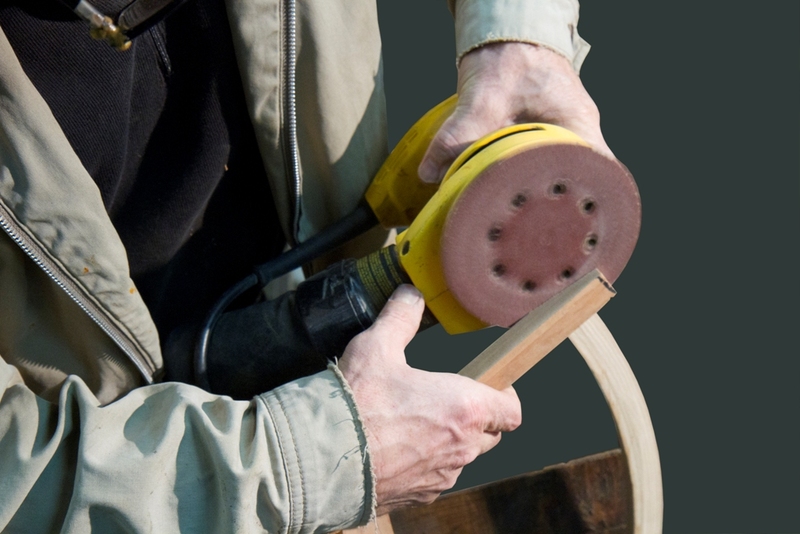 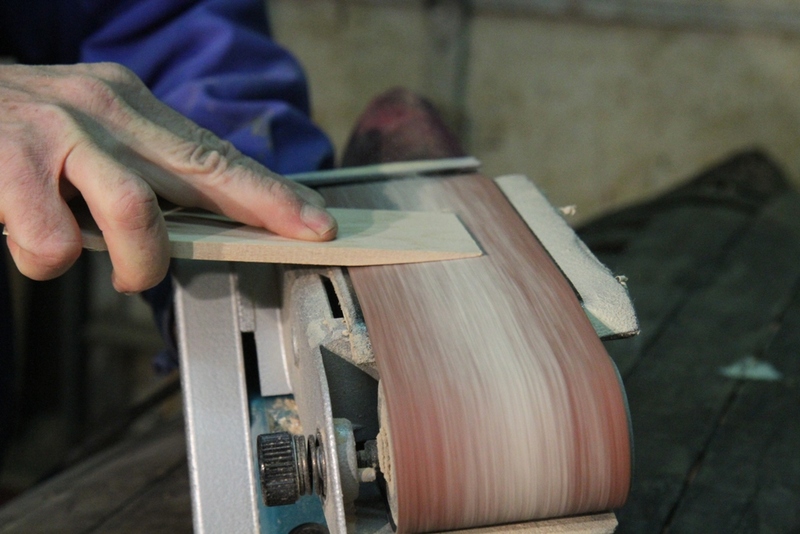 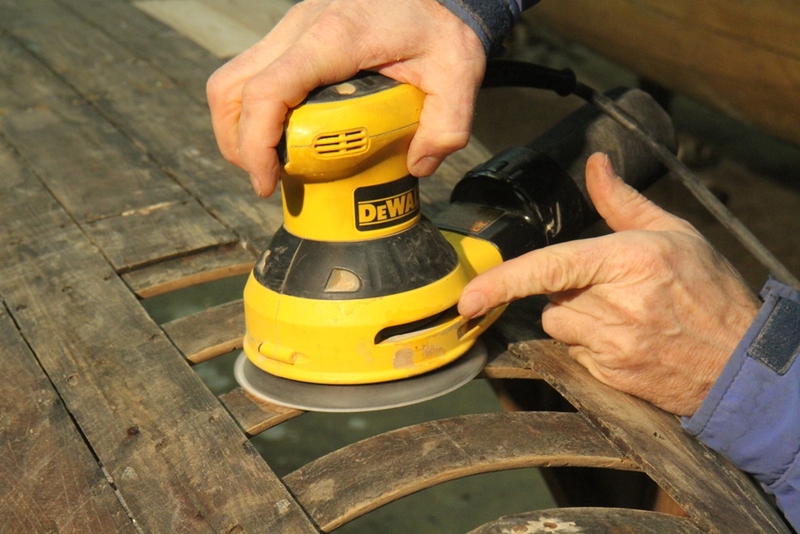 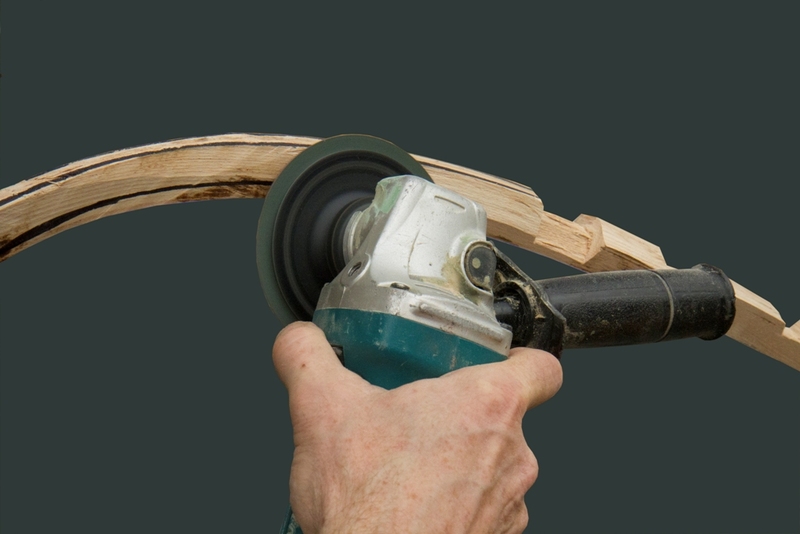 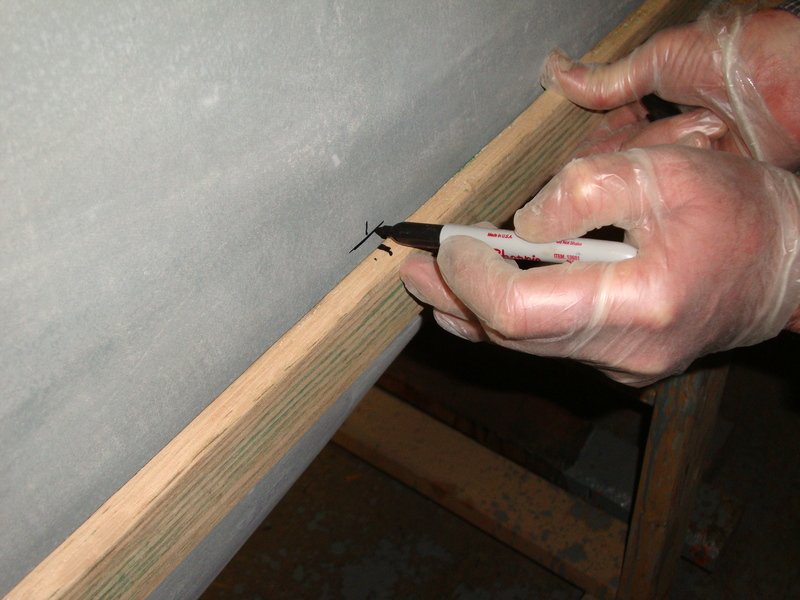 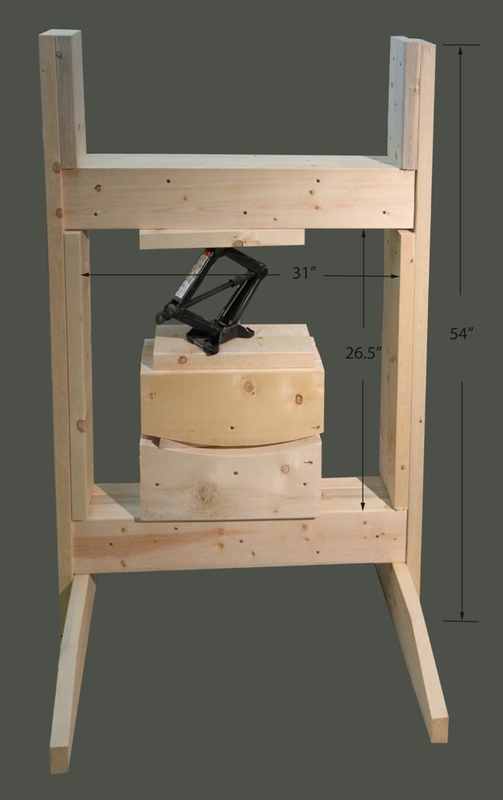 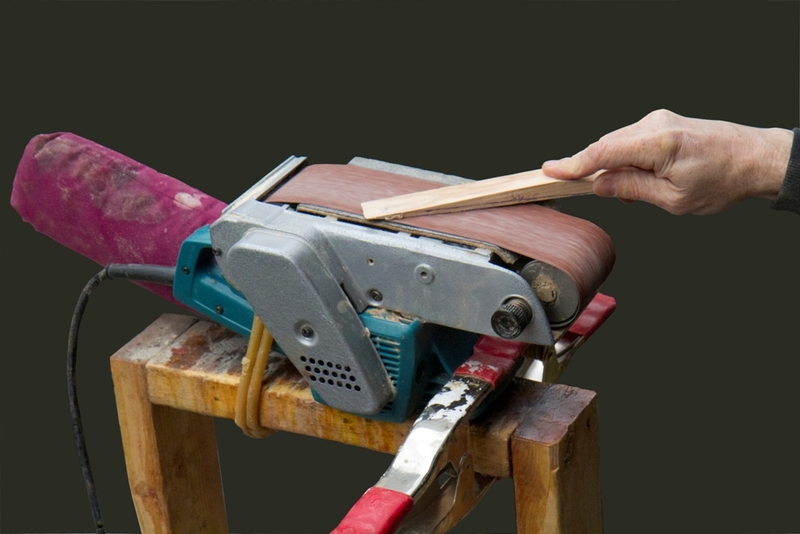 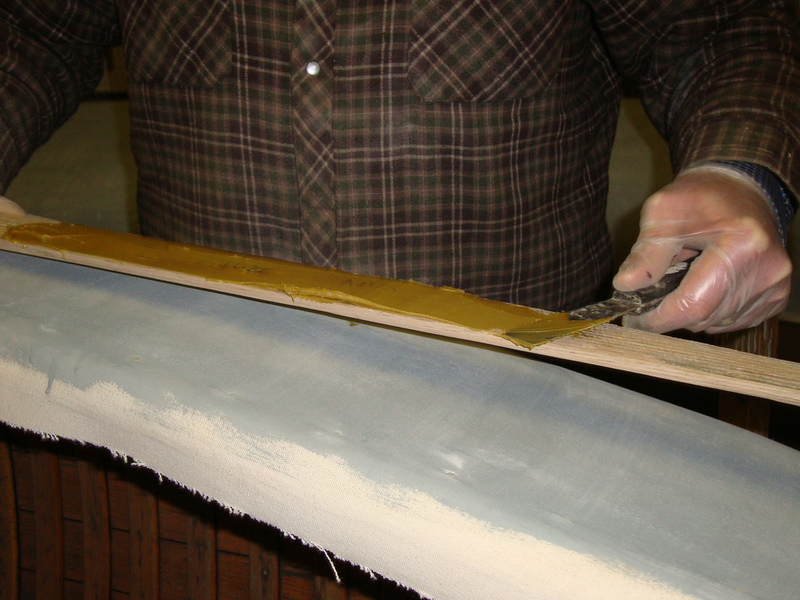 The entire painted surface of the canvas was sanded with 120-grit paper on a random-orbital sander. 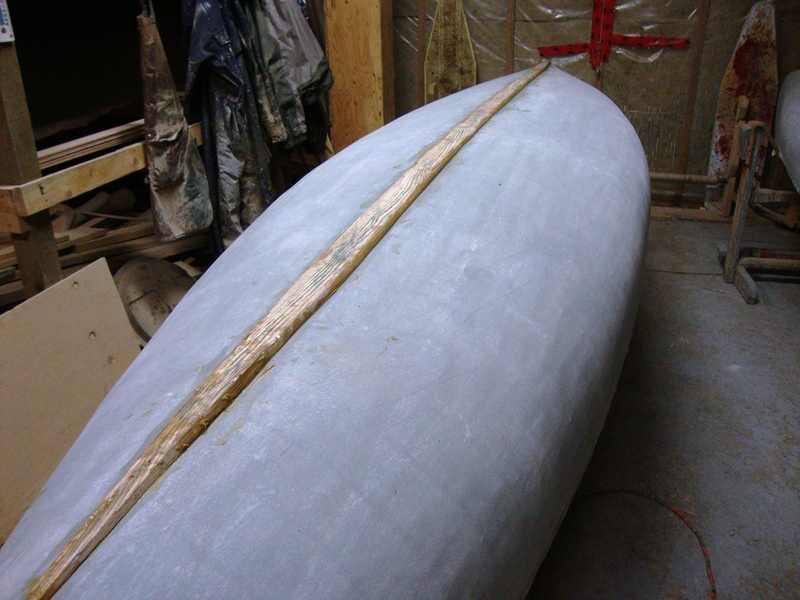 Most of the bottom was scuffed and/or gouged by encountered with rocks. 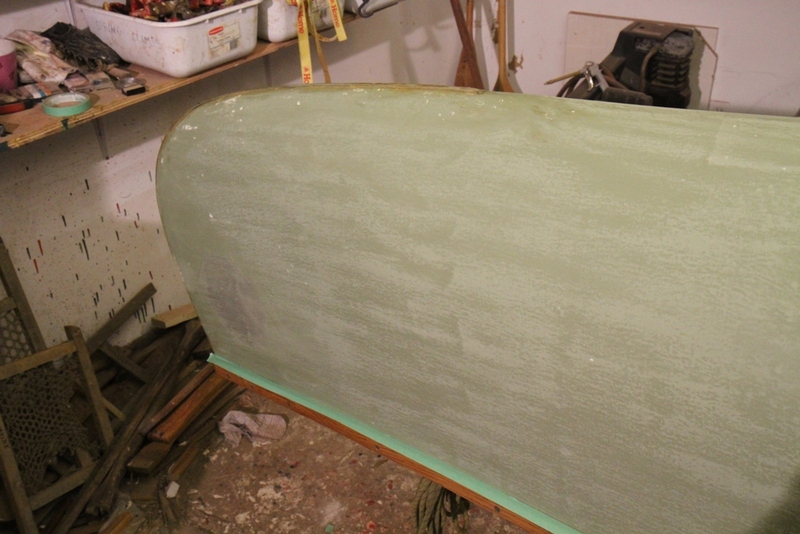 The sanding smoothed out the surface and prepped it for a fresh coat of paint. 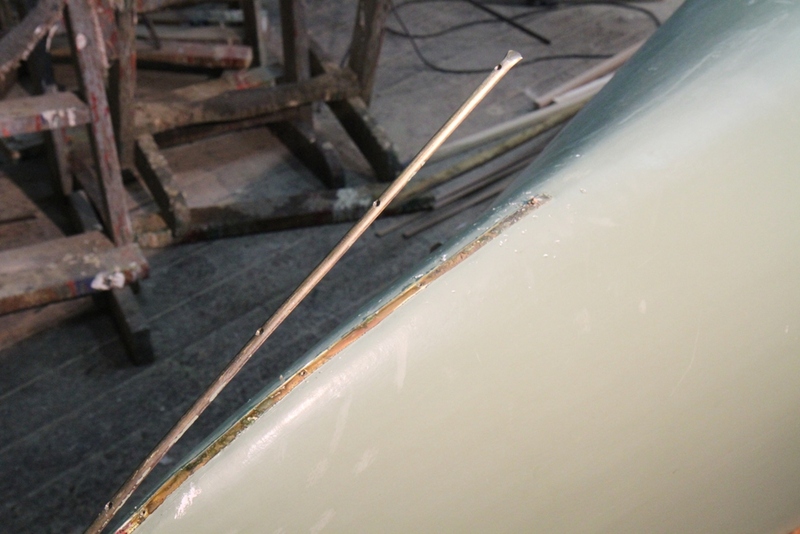 The stem-band was re-installed with new bronze screws (in this case, ¾”- #4 flat-head, slotted screws). 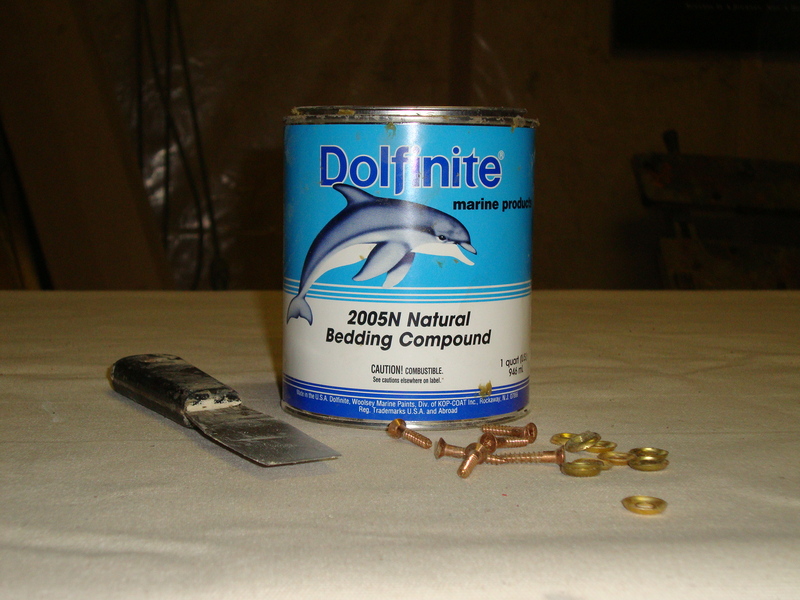 It was sealed with Dolfinite marine bedding compound and allowed to set overnight. 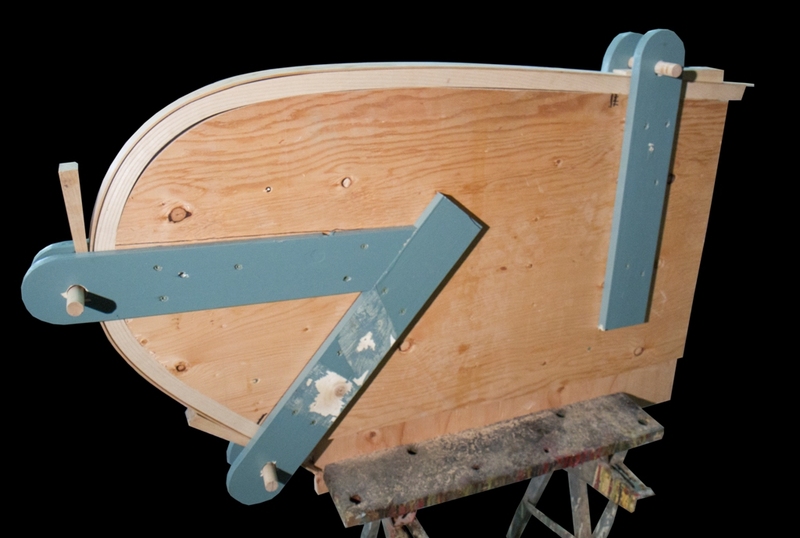 The outwales were masked with tape before a fresh coat of oil-based alkyd enamel paint (thinned 12% with paint thinner) was applied with a disposable foam brush. 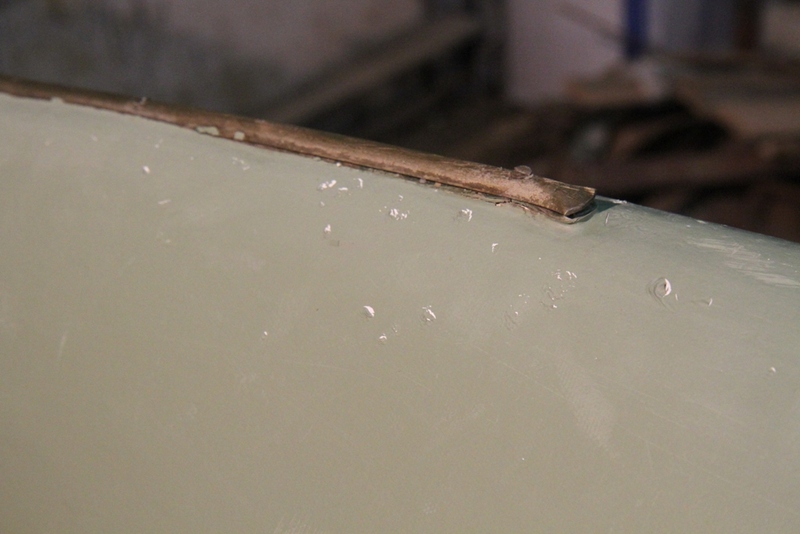 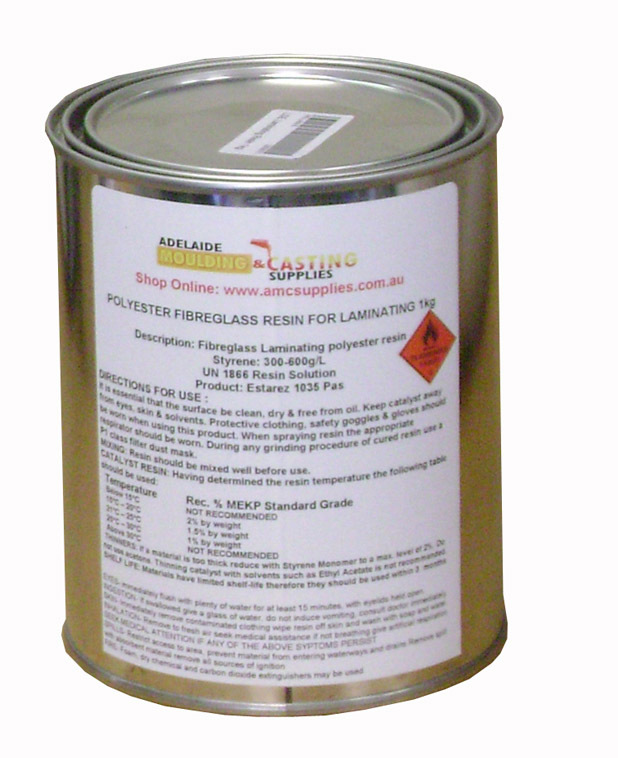 The masking tape was removed about an hour after the paint was applied. 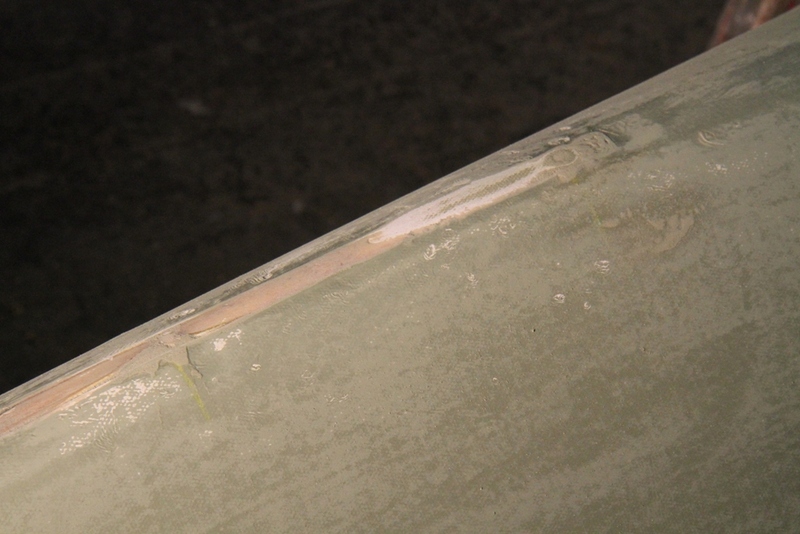 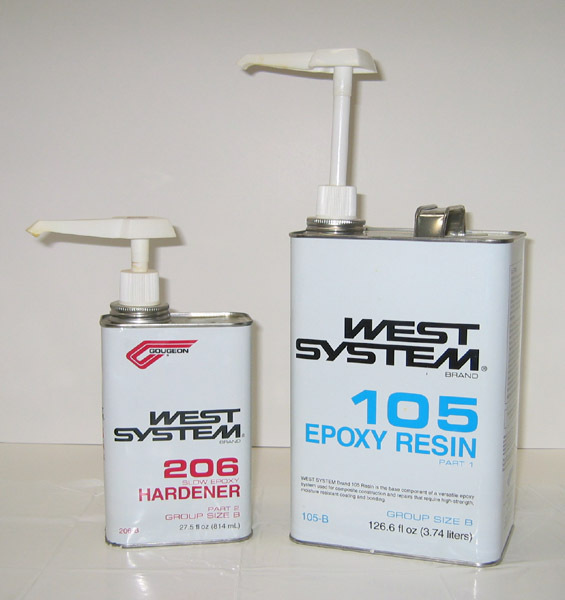 Any paint that ended up on the outwales was removed with a little paint thinner on a clean rag. 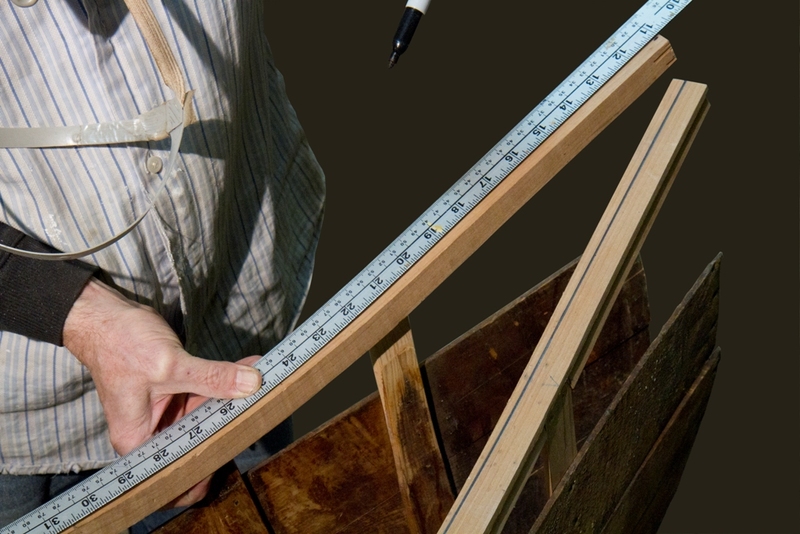 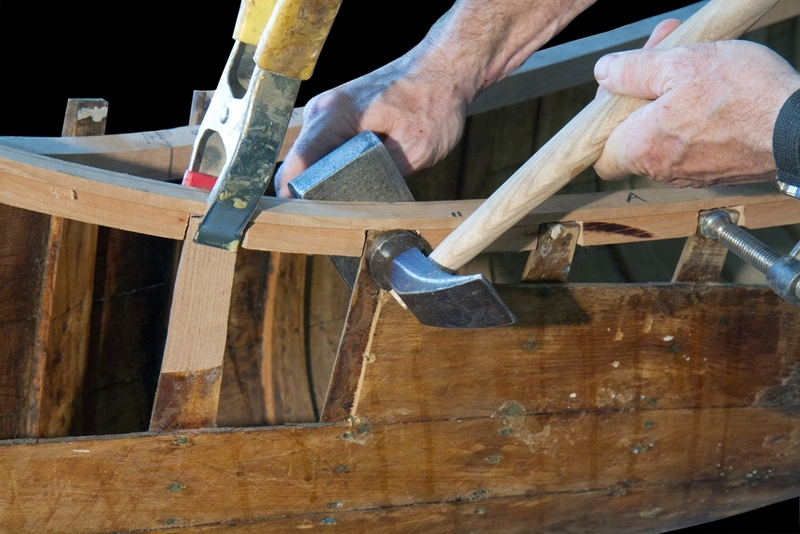 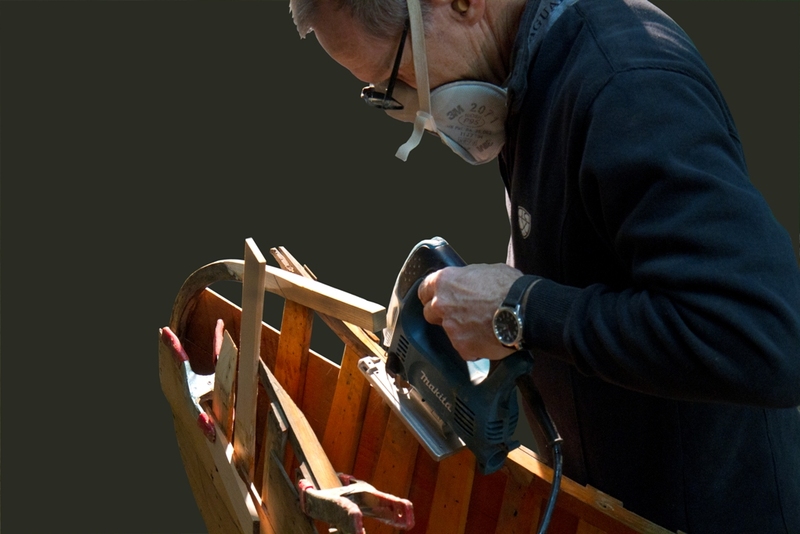 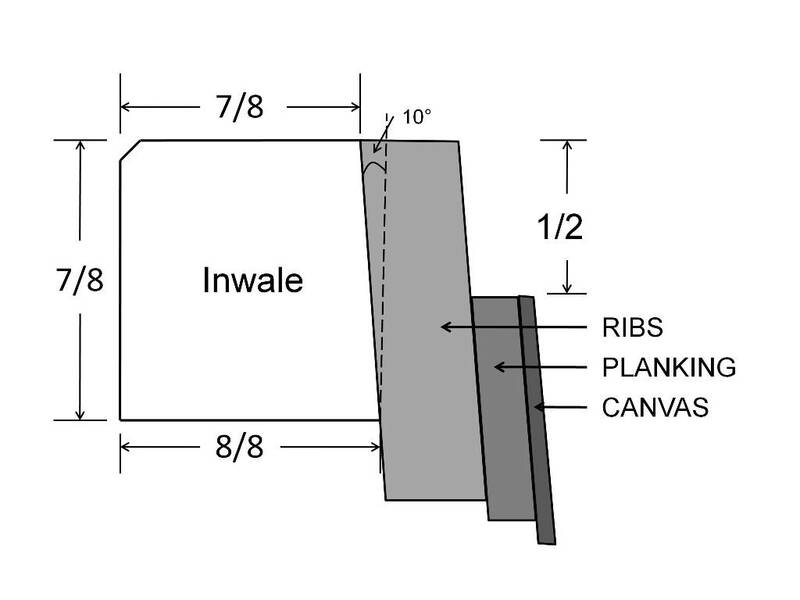 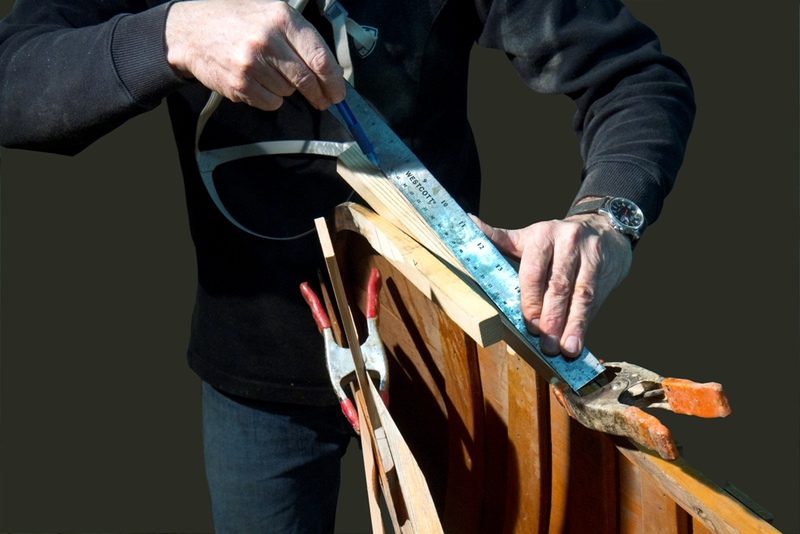 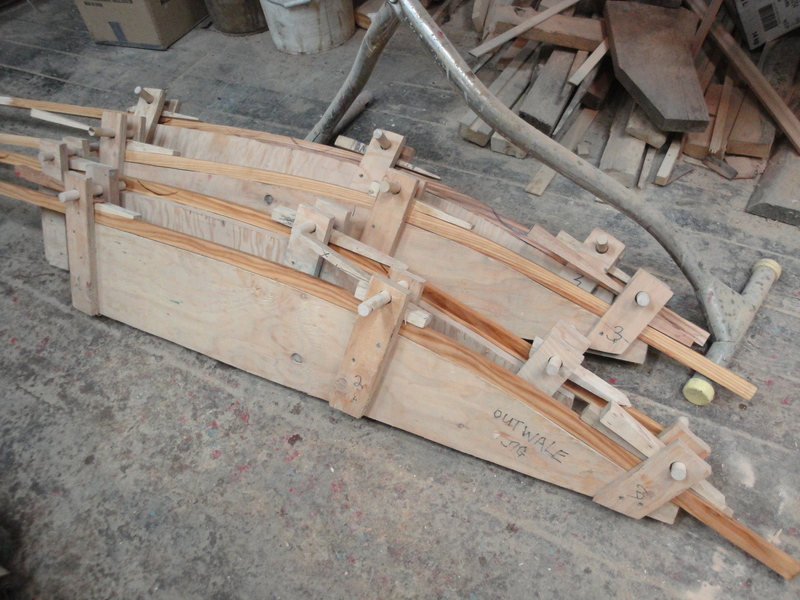 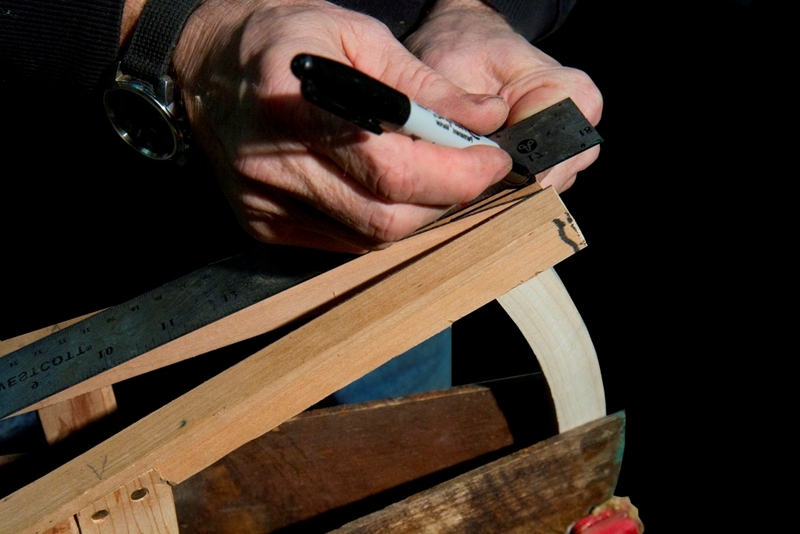 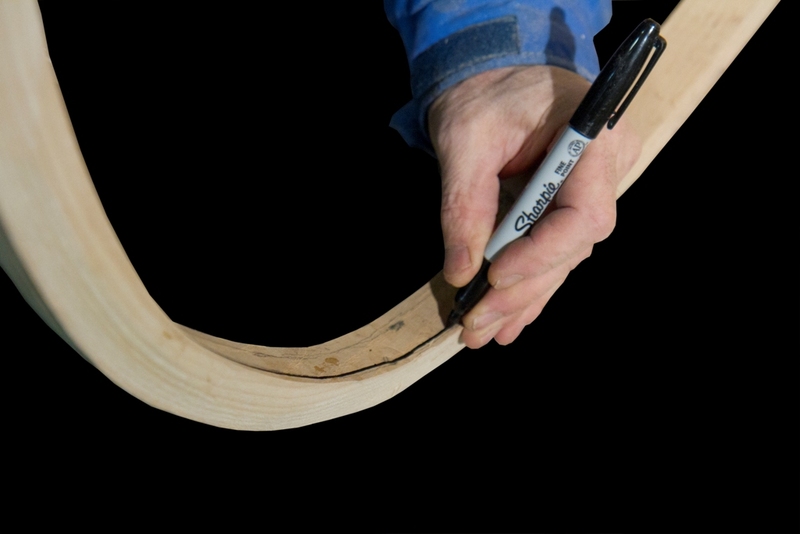 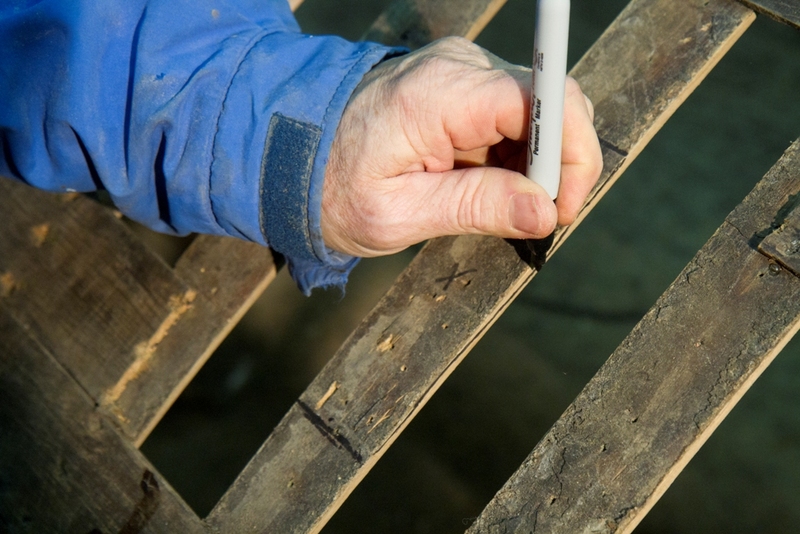 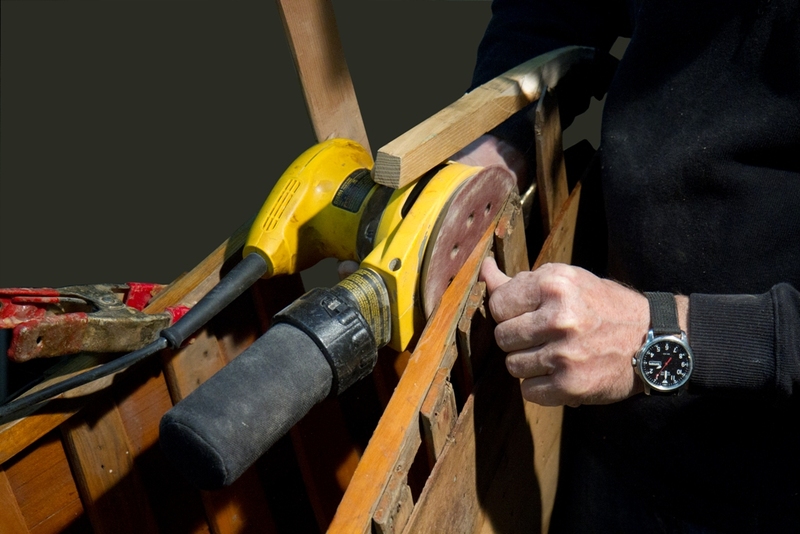 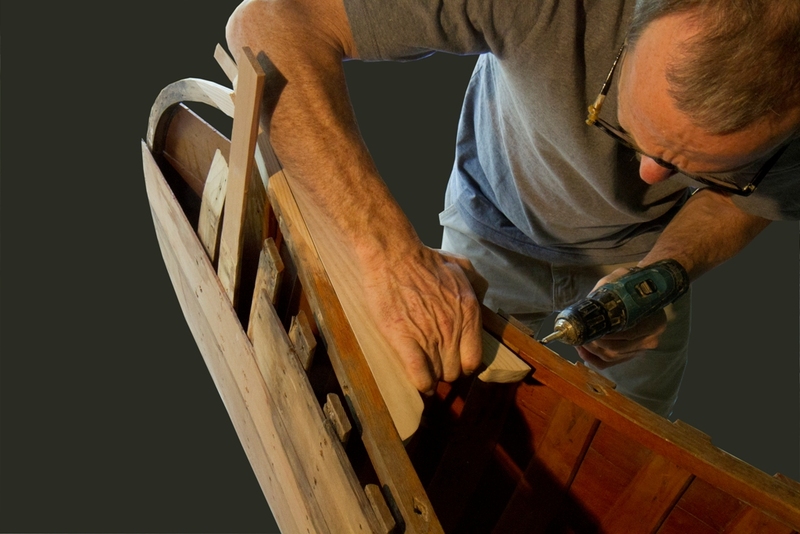 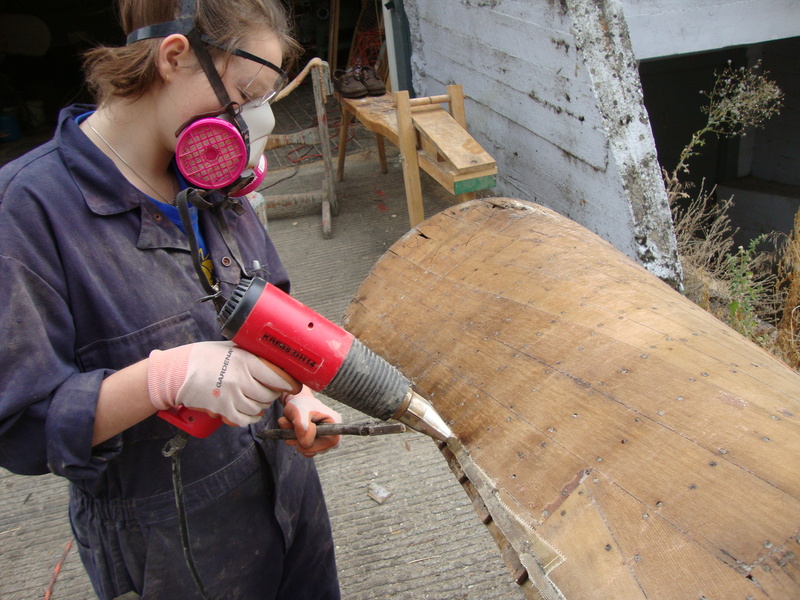 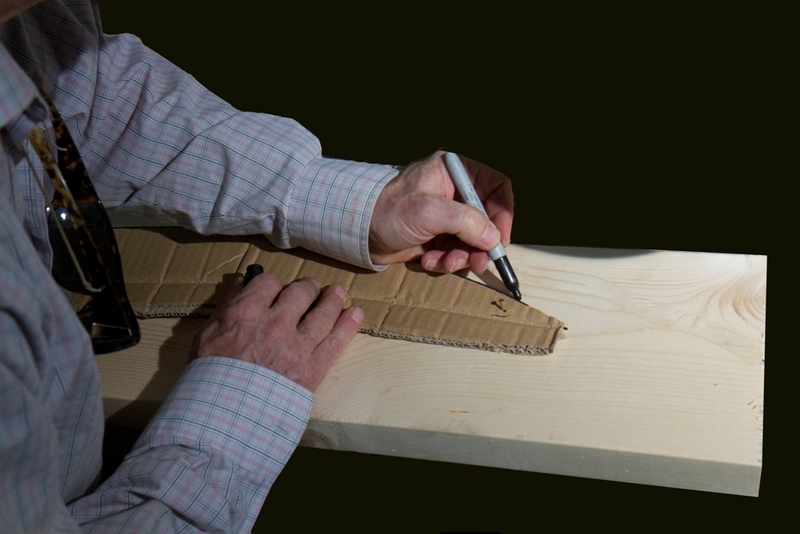 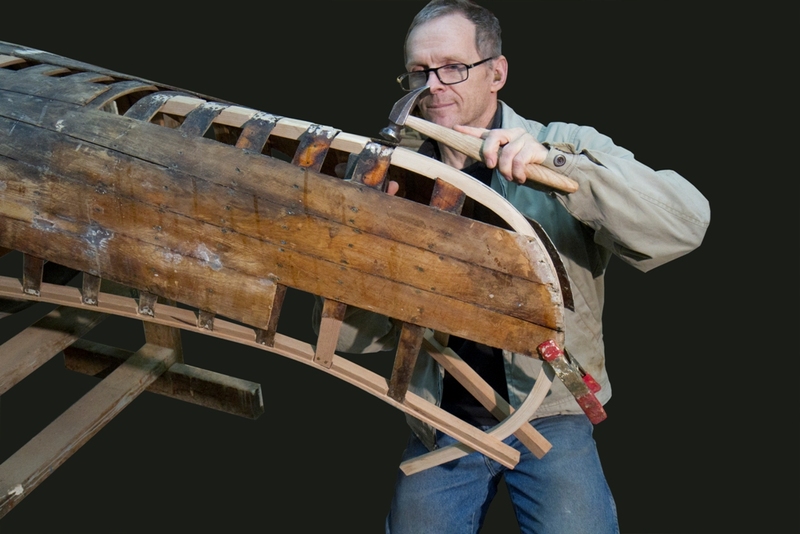 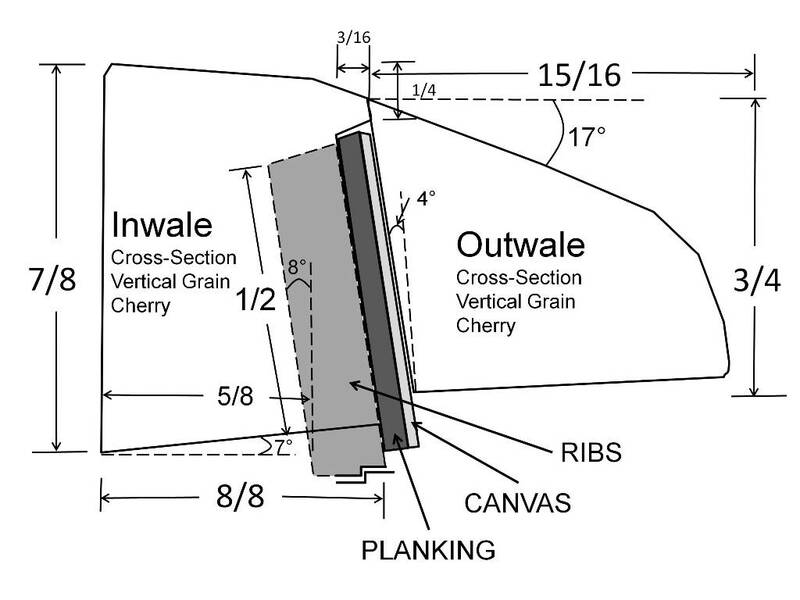 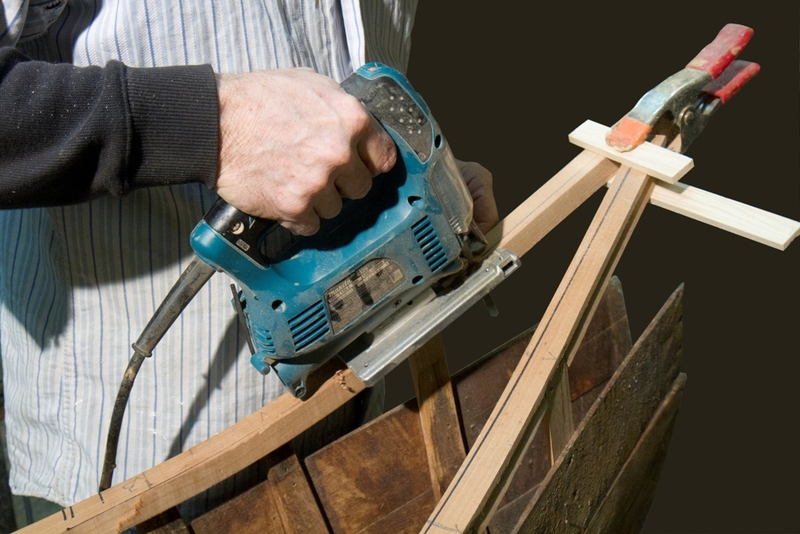 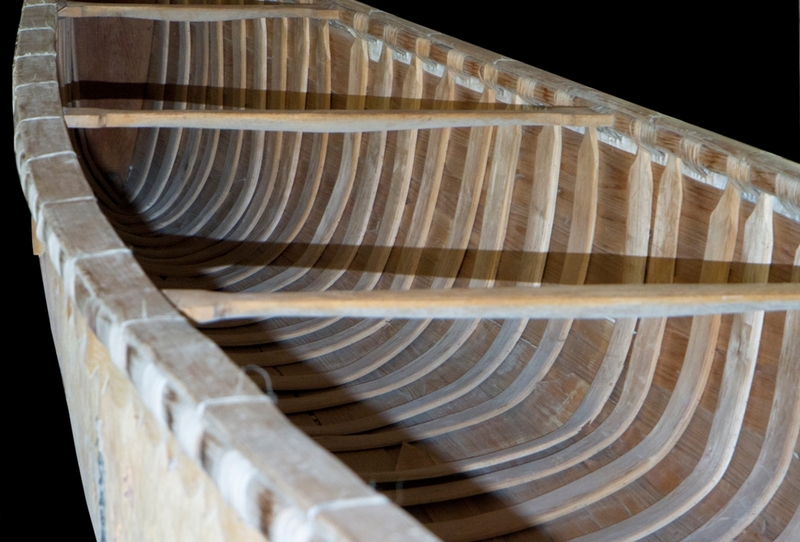 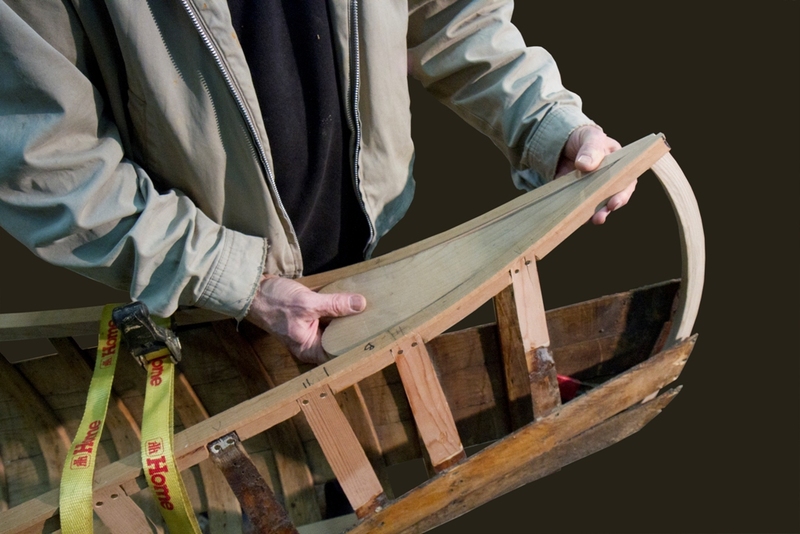 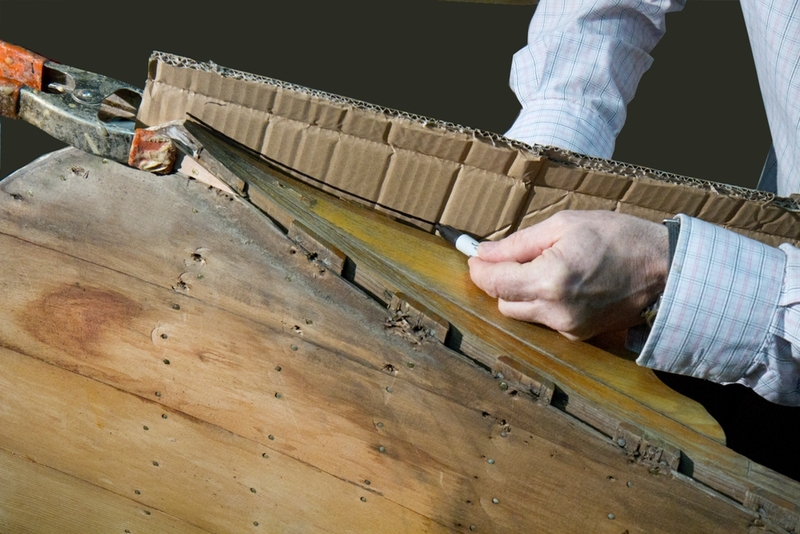 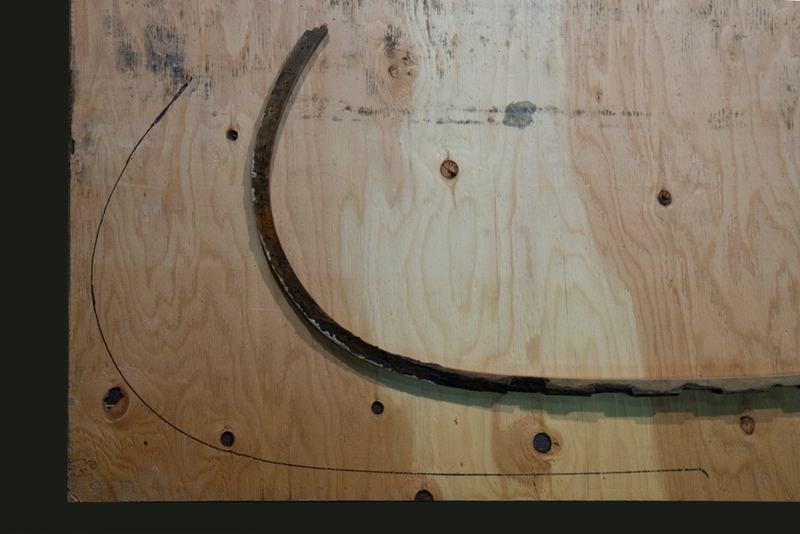 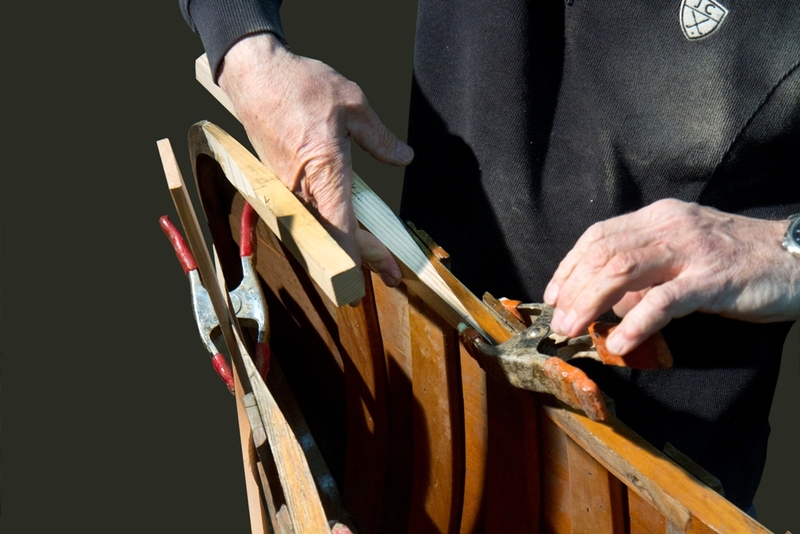 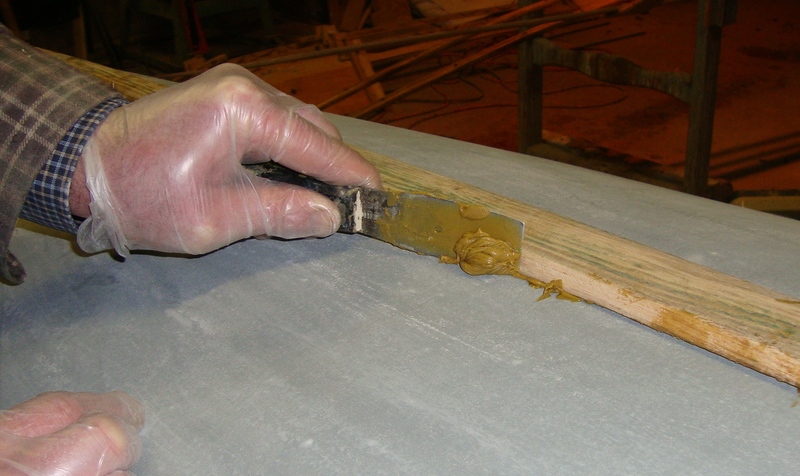 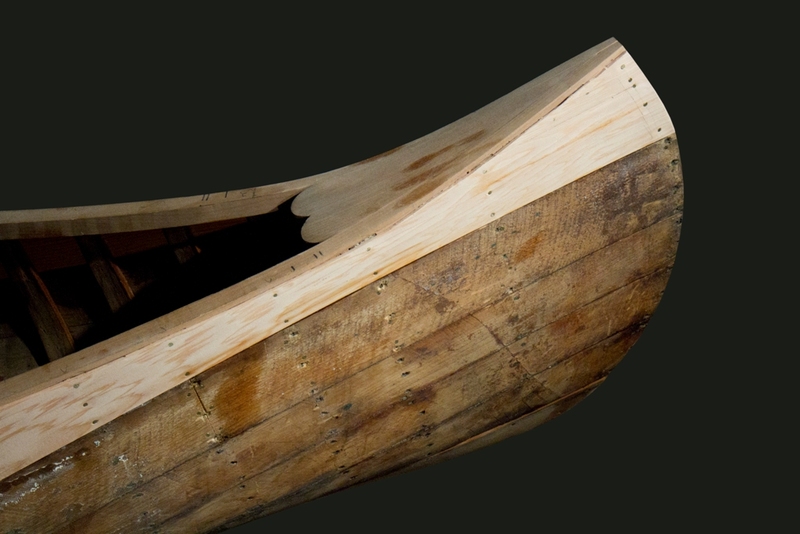 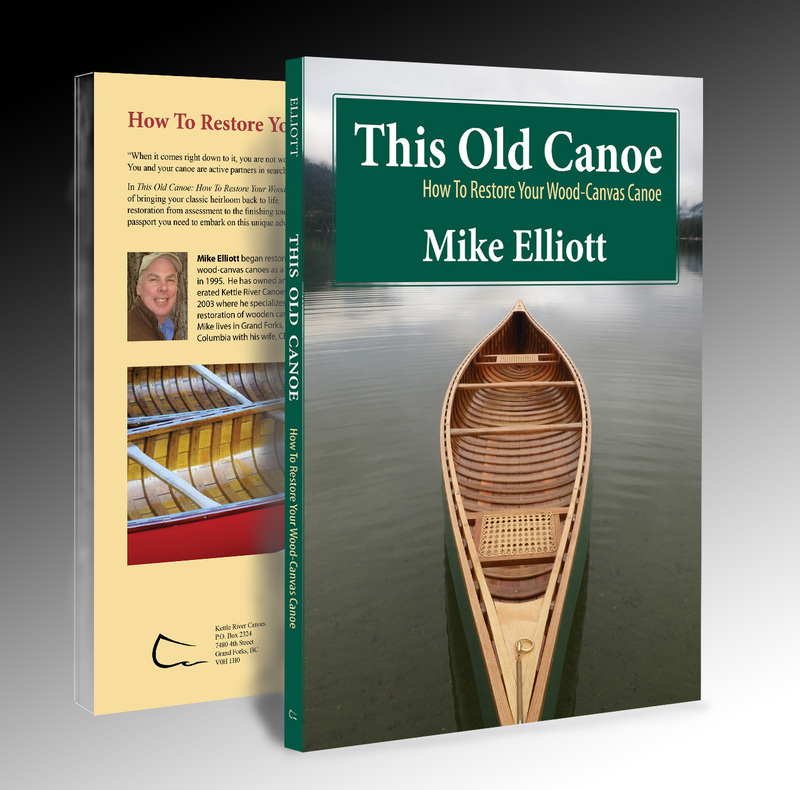 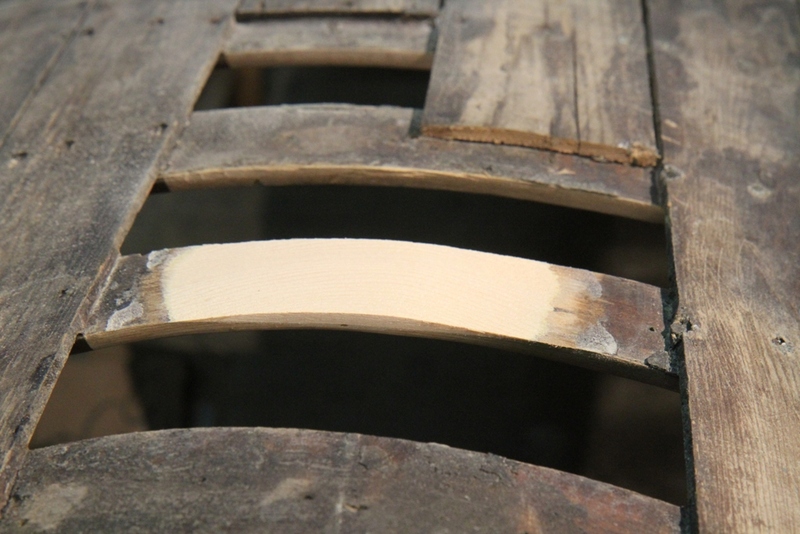 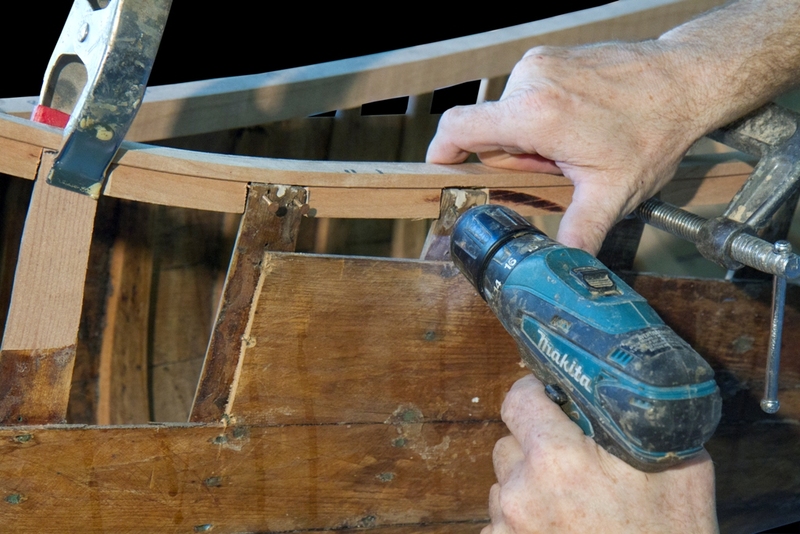 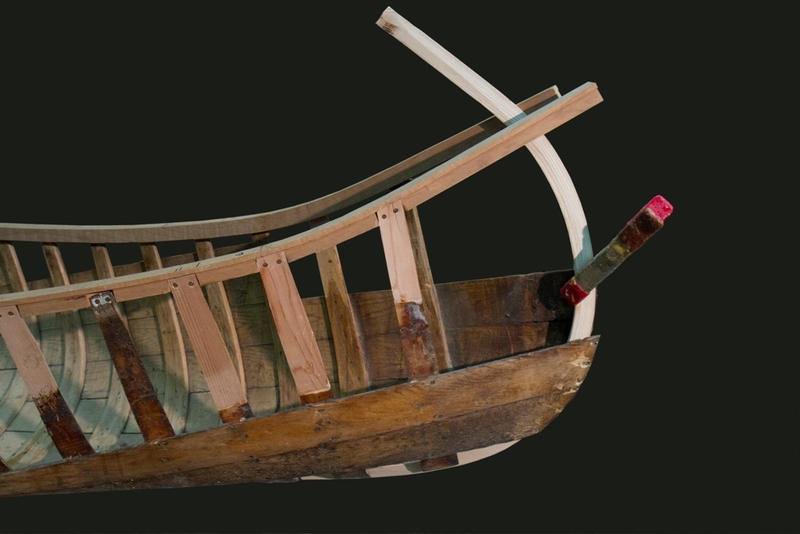 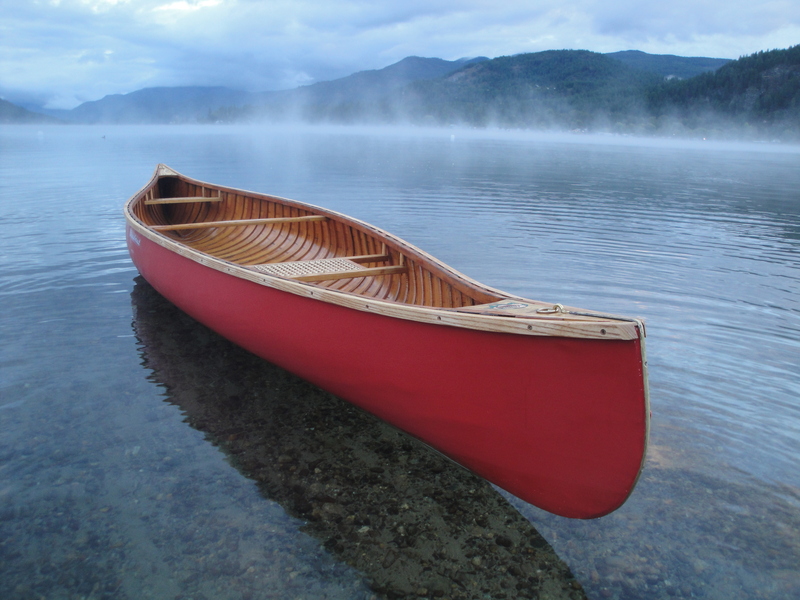 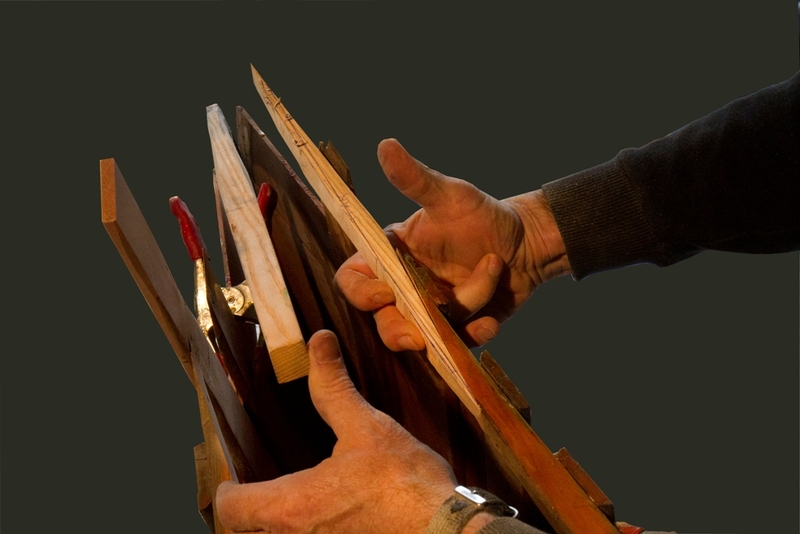 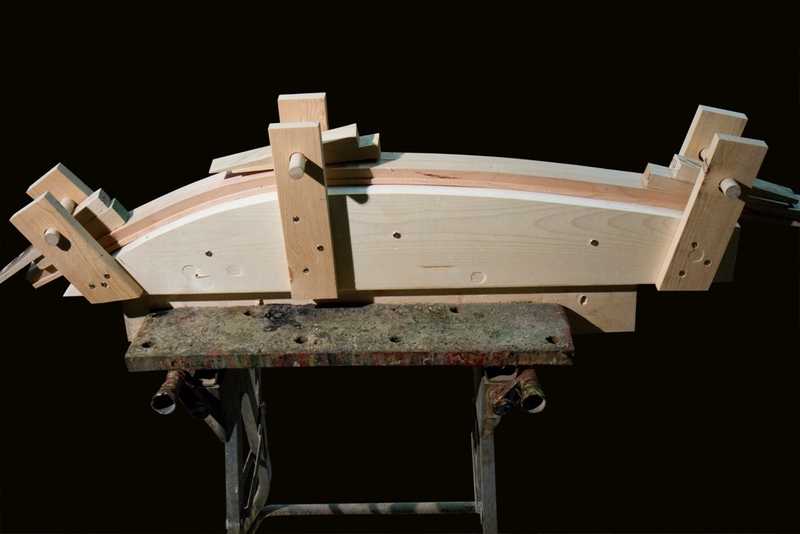 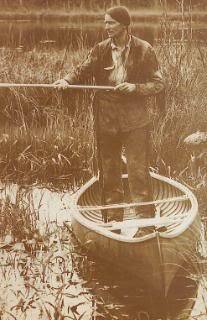 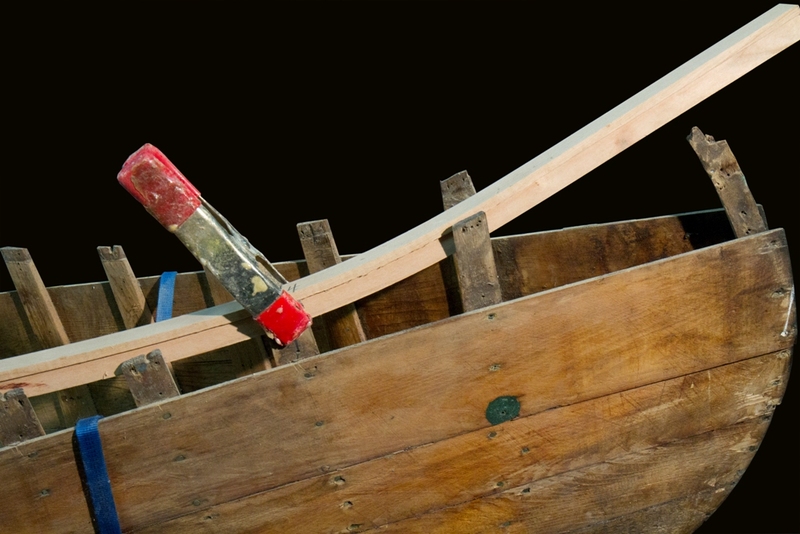 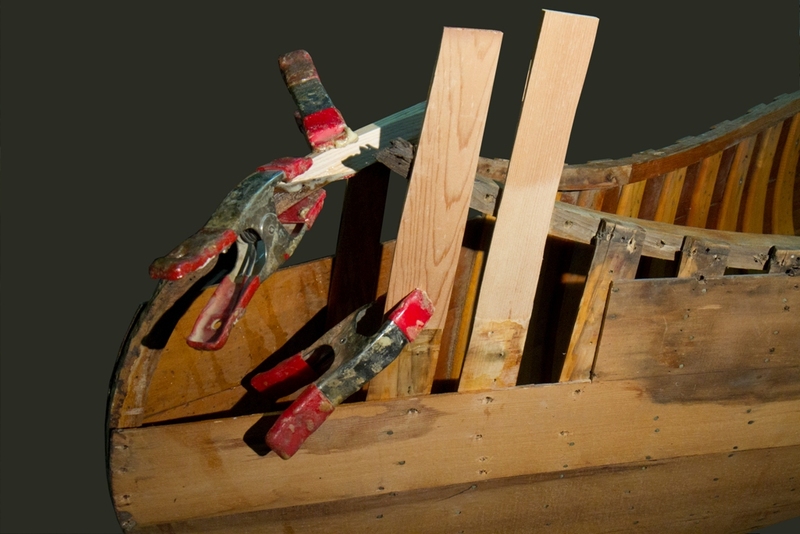 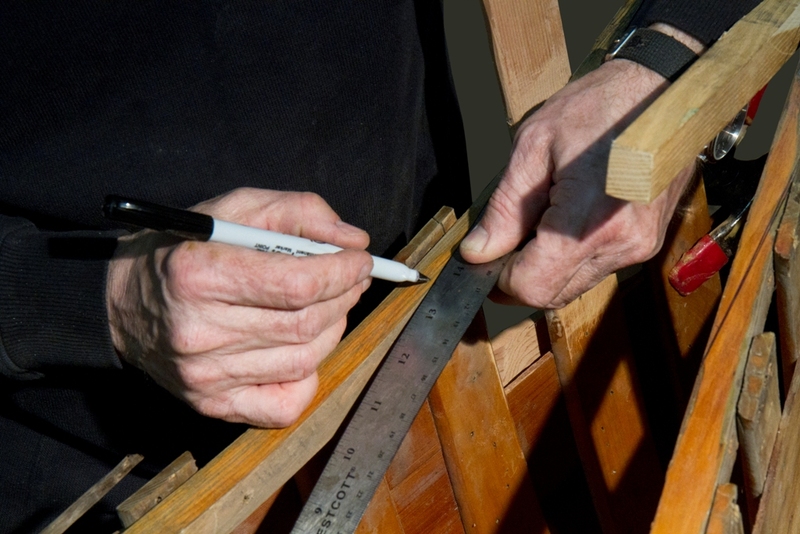 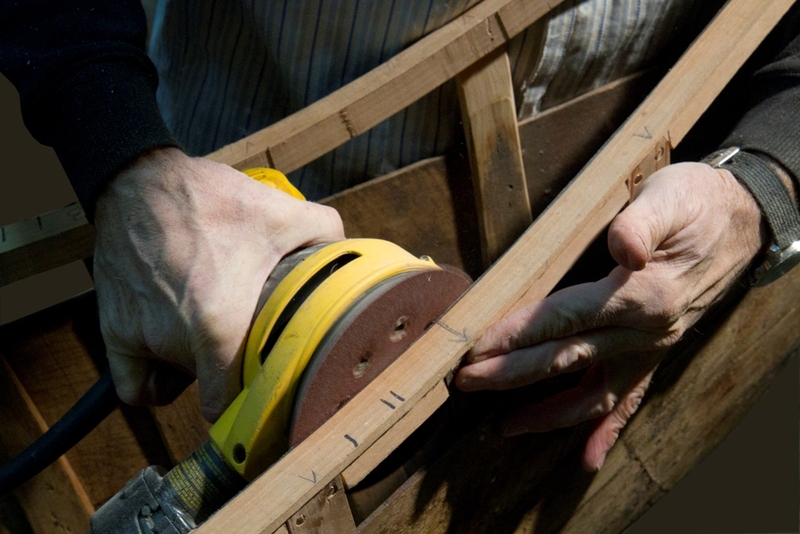 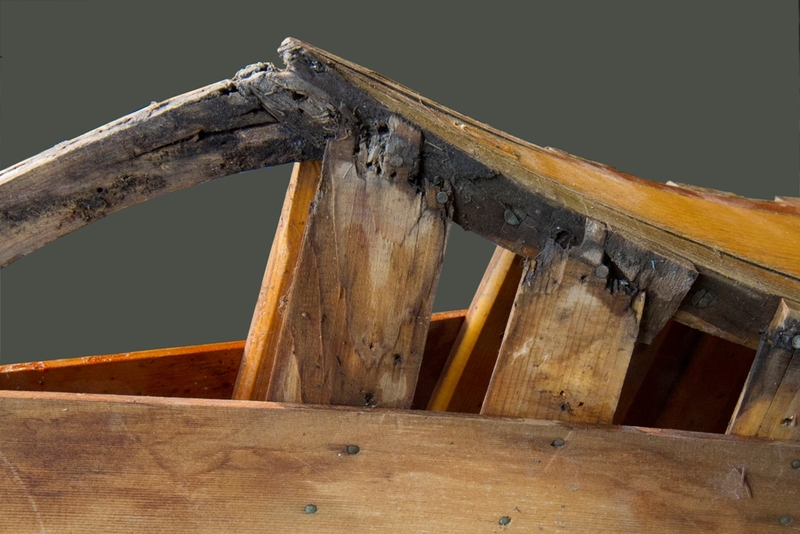 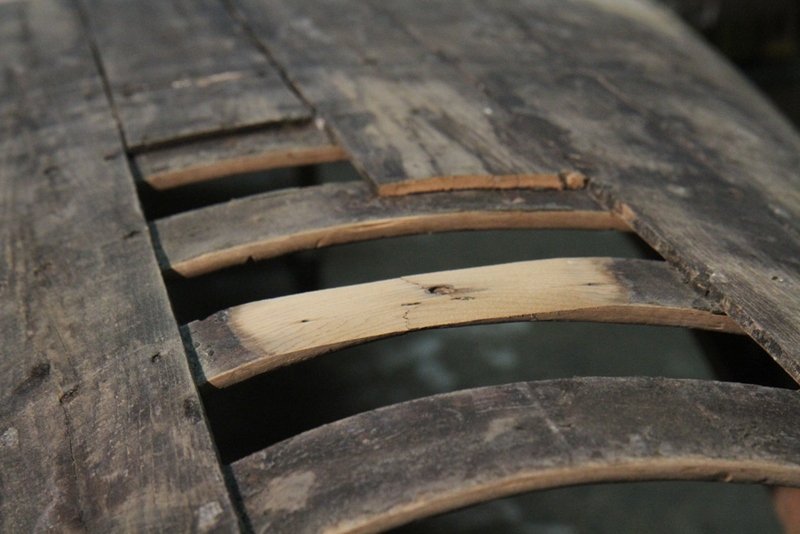 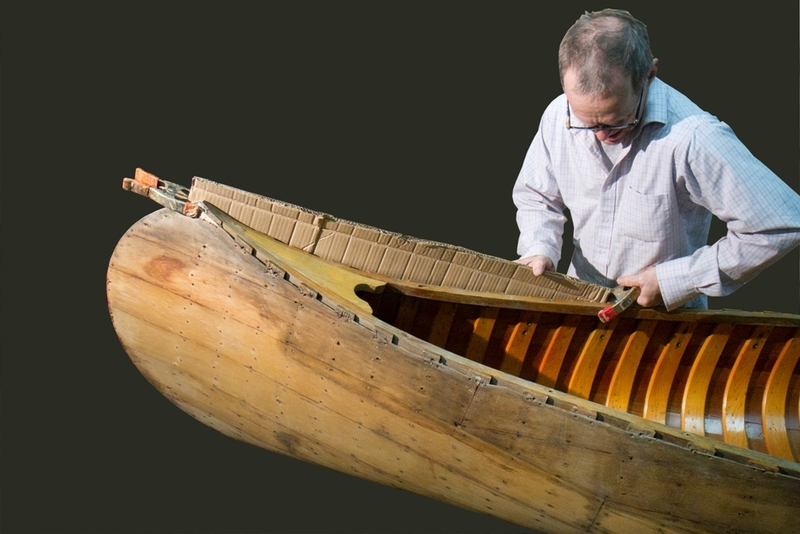 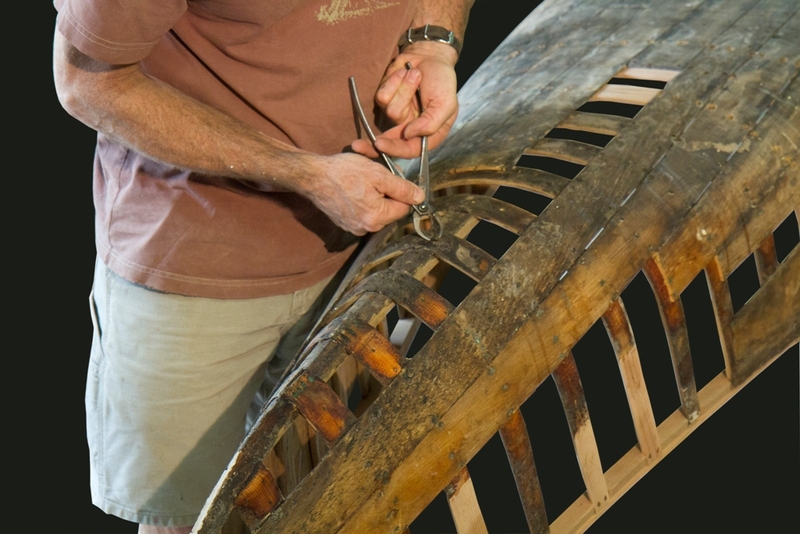 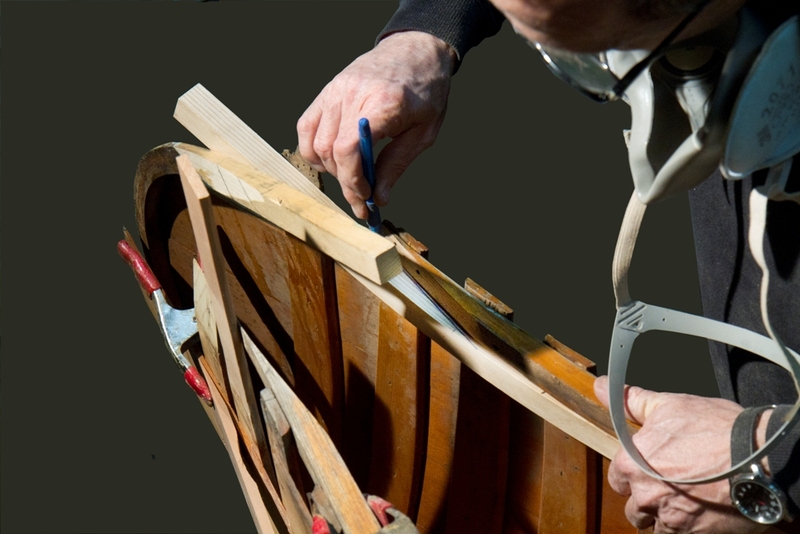 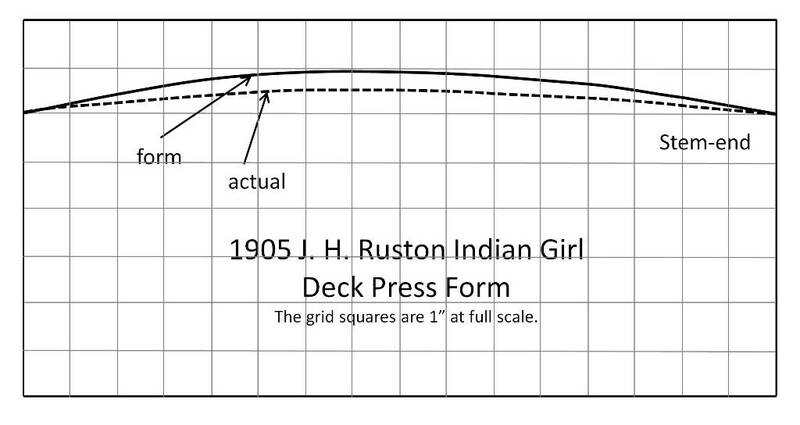 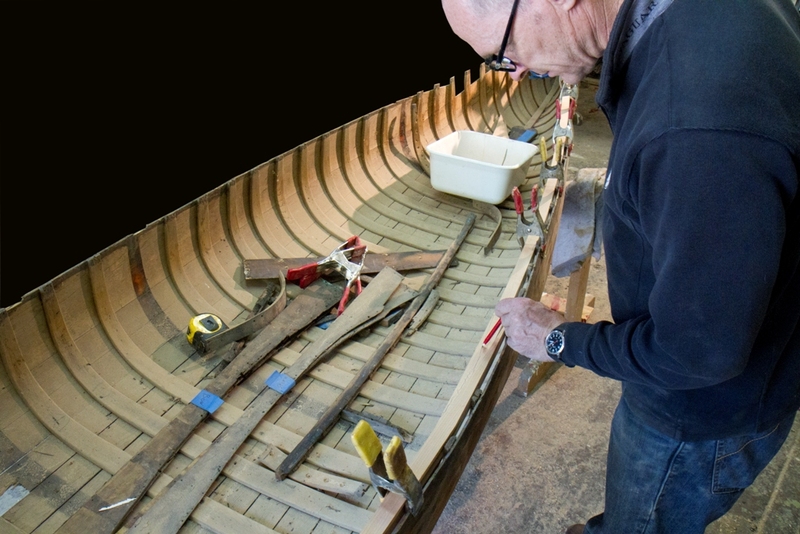 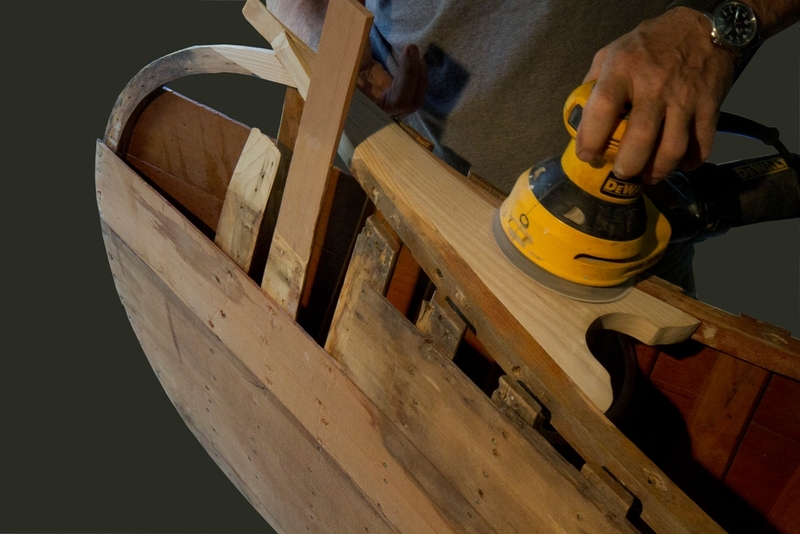 The entire restoration process is described in my book – This Old Canoe: How To Restore Your Wood Canvas Canoe.